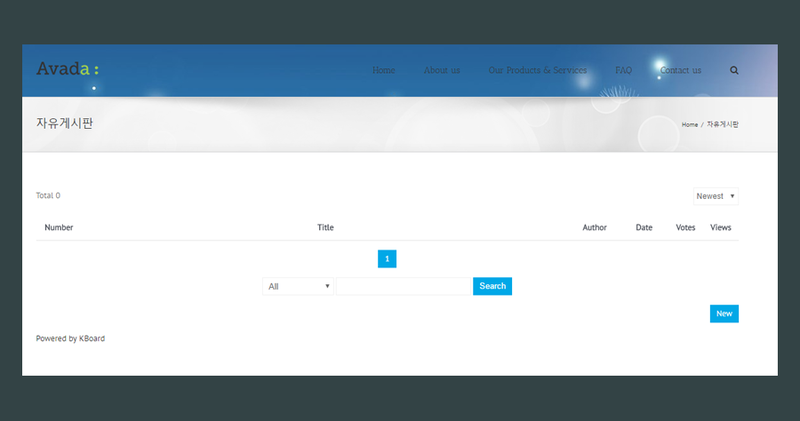 [fusion_builder_container hundred_percent=”yes” overflow=”visible”][fusion_builder_row][fusion_builder_column type=”1_1″ background_position=”left top” background_color=”” border_size=”” border_color=”” border_style=”solid” spacing=”yes” background_image=”” background_repeat=”no-repeat” padding=”” margin_top=”0px” margin_bottom=”0px” class=”” id=”” animation_type=”” animation_speed=”0.3″ animation_direction=”left” hide_on_mobile=”no” center_content=”no” min_height=”none”][fusion_dropcap color=”” boxed=”no” boxed_radius=”8px” class=”” id=””]DIY [/fusion_dropcap]웹사이트 따라하기는 워드프레스를 이용해서 여러분이 본인의 힘으로 직접 웹사이트를 제작하는 방법을 자세하게 알려드리는 가이드입니다. 본 가이드에서는 Avada라는 디자인 테마를 사용하고 있습니다. 본 가이드를 진행 하시기 위해서는 Avada 디자인테마가 반드시 필요합니다. 본 가이드에서는 가능한 복잡한 기술적인 설명은 과감하게 생략하고 실제로 웹사이트를 만드는데 꼭 필요한 설명과 화면 위주로만 정보를 최대한 간추려서 정리 했습니다. 꼭 설명이 필요한 용어의 정리는 용어가 처음 나타나는 곳에서 바로 보실 수 있도록 했습니다. 아래 순서로 가이드가 진행 됩니다. 웹호스팅 구입을 위해서 워드프레스 웹호스팅 선택하기를 참조 하세요. 웹호스팅 구입하기 및 워드프레스 설치를 위해서 사이트그라운드 웹호스팅 구입 및 기본설정하기를 참조하세요. 아래 내용들을 순차적으로 진행 하시기 바랍니다. 이전 단계인 웹호스팅 구입 및 설정 단계를 잘 따라하신 경우 이미 워드프레스가 설치 되 있을 것 입니다. 만약, 아직 웹호스팅 구입 및 설정 단계를 진행 하지 않으신 경우는 위 단계를 먼저 진행 하세요. 먼저 워드프레스 관리자 화면으로 로그인 합니다. 워드프레스 관리자 주소(URL)는 원래 웹사이트 주소 뒤에 “/wp-admin”을 붙여주면 됩니다. 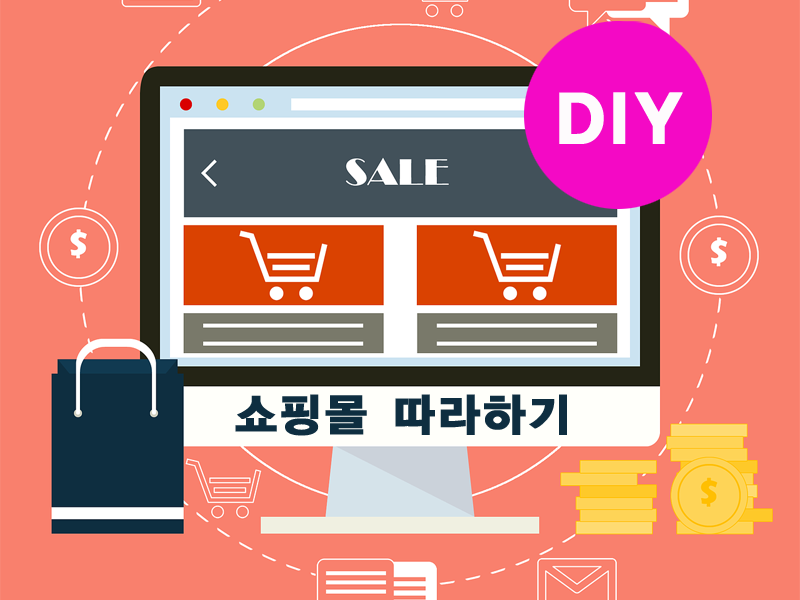 예를들어 웹사이트 주소가 “MYDOMAIN.COM” 이라면 다음과 같이 해주시면 됩니다. 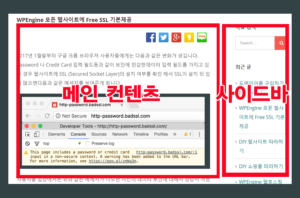 관리자주소 URL ) MYDOMAIN.COM/wp-admin, “/wp-admin”는 반드시 소문자로 입력하셔야 합니다.인터넷 브라우져에서 위와 같이 주소(URL)를 입력하고 이동하면 아래 화면이 나타 납니다. 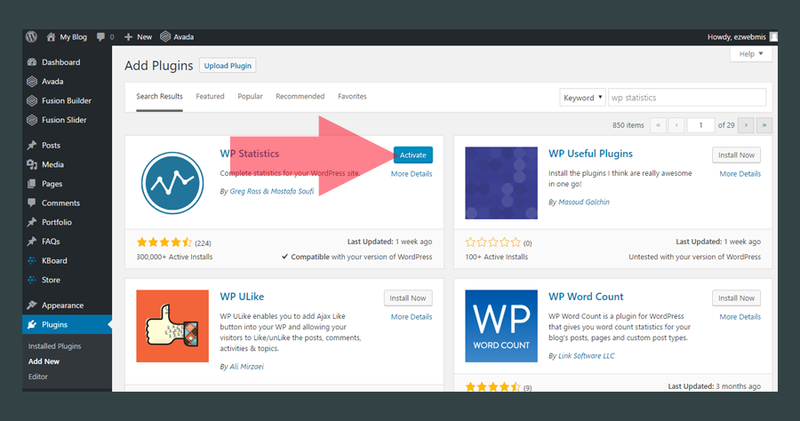 [fusion_fontawesome icon=”fa-chevron-right” circle=”yes” size=”13px” iconcolor=”” circlecolor=”” circlebordercolor=”” rotate=”” spin=”no” animation_type=”0″ animation_direction=”down” animation_speed=”0.1″ alignment=”left” class=”” id=””/]아래 화면에서 Username or Email Address 에 관리자 아이디 혹은 이메일을 입력 하시고, Password란에 패스워드를 입력하신 후 Log In 버튼을 클릭 합니다. 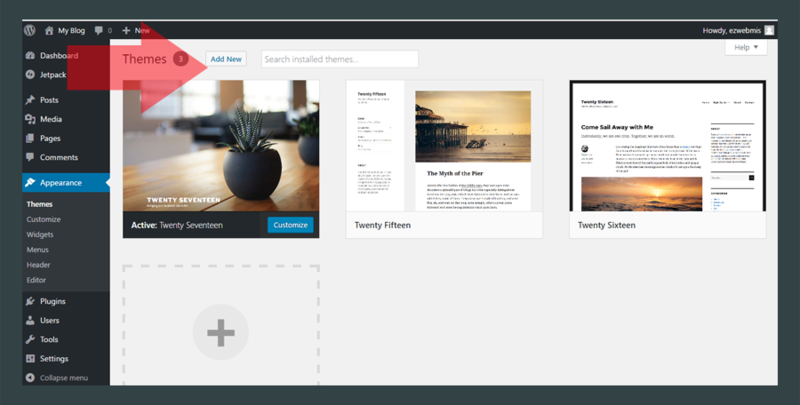 [fusion_fontawesome icon=”fa-chevron-right” circle=”yes” size=”13px” iconcolor=”” circlecolor=”” circlebordercolor=”” rotate=”” spin=”no” animation_type=”0″ animation_direction=”down” animation_speed=”0.1″ alignment=”left” class=”” id=””/]로그인을 하면 아래와 같은 화면이 나타납니다. 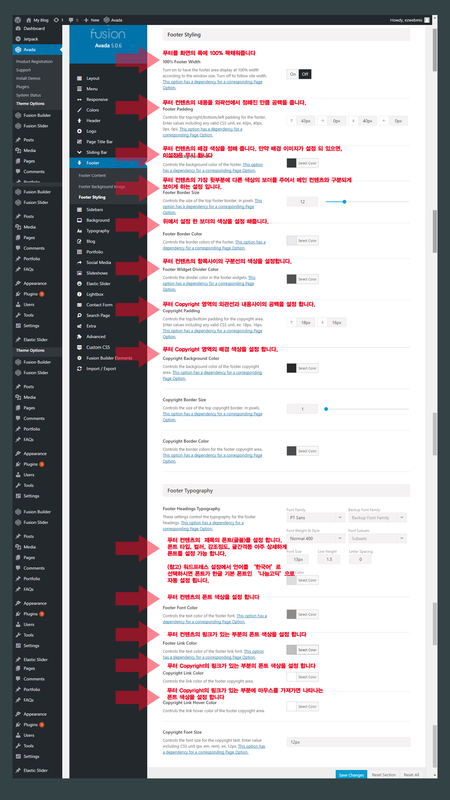 [fusion_fontawesome icon=”fa-chevron-right” circle=”yes” size=”13px” iconcolor=”” circlecolor=”” circlebordercolor=”” rotate=”” spin=”no” animation_type=”0″ animation_direction=”down” animation_speed=”0.1″ alignment=”left” class=”” id=””/]아래 화면과 같이 Appearance > Themes를 클릭 합니다. [fusion_fontawesome icon=”fa-chevron-right” circle=”yes” size=”13px” iconcolor=”” circlecolor=”” circlebordercolor=”” rotate=”” spin=”no” animation_type=”0″ animation_direction=”down” animation_speed=”0.1″ alignment=”left” class=”” id=””/]아래 화면에서 새로운(유료)테마를 설치 하기 위해서 ‘Add New’를 클릭 합니다. 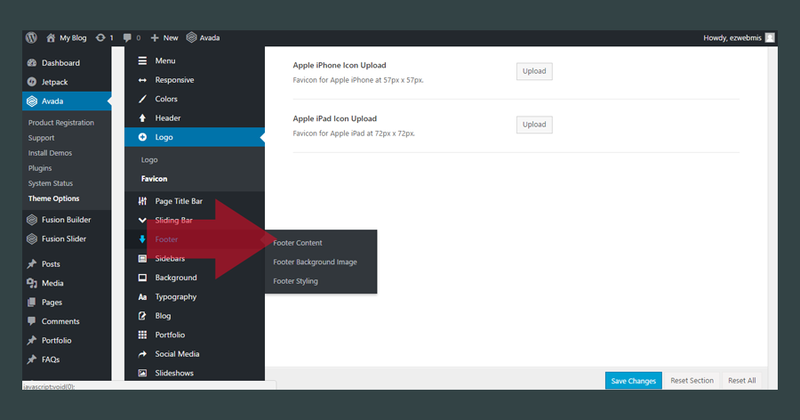 [fusion_fontawesome icon=”fa-chevron-right” circle=”yes” size=”13px” iconcolor=”” circlecolor=”” circlebordercolor=”” rotate=”” spin=”no” animation_type=”0″ animation_direction=”down” animation_speed=”0.1″ alignment=”left” class=”” id=””/]아래 그림과 같이 ‘Upload Theme’을 클릭 합니다. 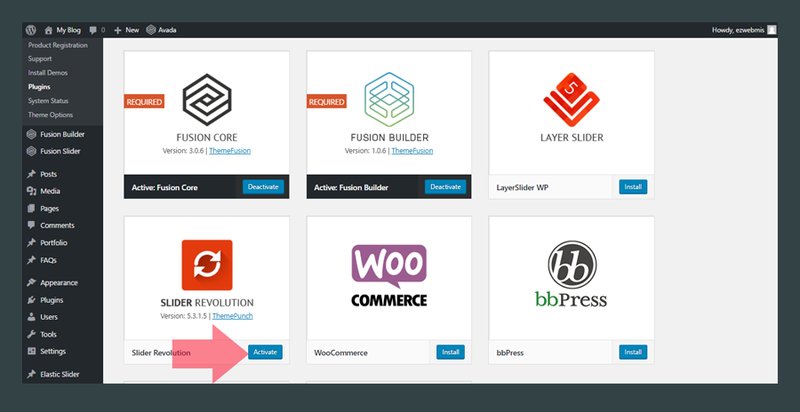 [fusion_fontawesome icon=”fa-chevron-right” circle=”yes” size=”13px” iconcolor=”” circlecolor=”” circlebordercolor=”” rotate=”” spin=”no” animation_type=”0″ animation_direction=”down” animation_speed=”0.1″ alignment=”left” class=”” id=””/]아래 그림과 같이 (1) ‘Choose File’을 클릭 하면 디자인 테마 화일을 선택하는 창이 나타납니다. 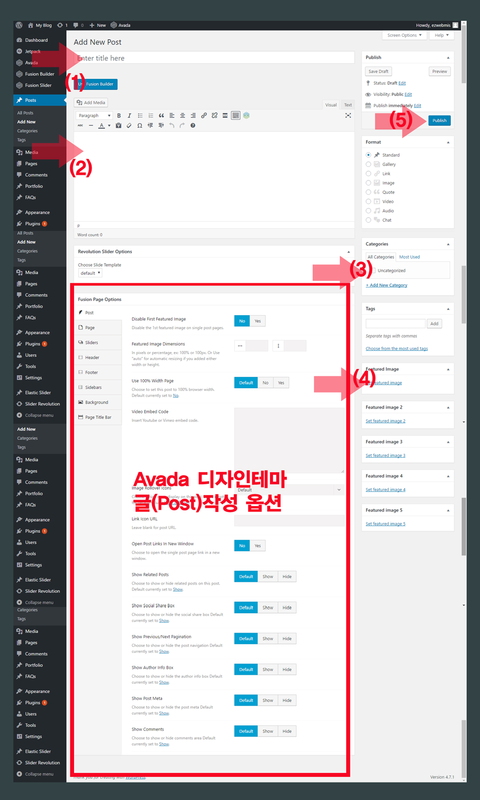 이미 다운 받아놓은 (2) Avada Theme 설치 화일을 선택 합니다 (3) ‘Open’을 클릭 합니다. 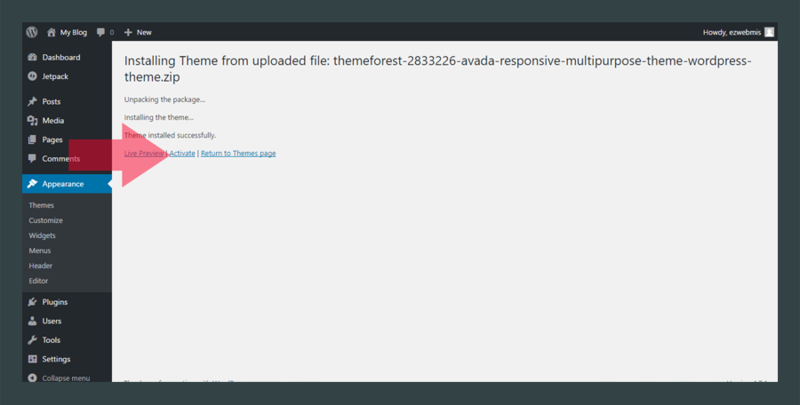 [fusion_fontawesome icon=”fa-chevron-right” circle=”yes” size=”13px” iconcolor=”” circlecolor=”” circlebordercolor=”” rotate=”” spin=”no” animation_type=”0″ animation_direction=”down” animation_speed=”0.1″ alignment=”left” class=”” id=””/]아래 그림과 같이 ‘Install Now’를 클릭 합니다. 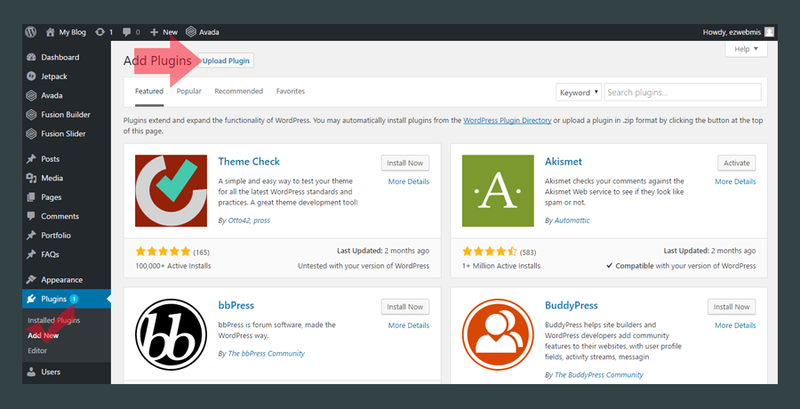 [fusion_fontawesome icon=”fa-chevron-right” circle=”yes” size=”13px” iconcolor=”” circlecolor=”” circlebordercolor=”” rotate=”” spin=”no” animation_type=”0″ animation_direction=”down” animation_speed=”0.1″ alignment=”left” class=”” id=””/]설치과정은 보통 1분 미만이 소요됩니다. 설치가 완료되면 아래 그림과 같은 화면이 나타납니다. ‘Activate’를 클릭 합니다. 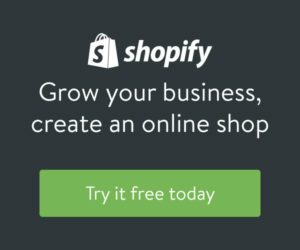 [fusion_fontawesome icon=”fa-chevron-right” circle=”yes” size=”13px” iconcolor=”” circlecolor=”” circlebordercolor=”” rotate=”” spin=”no” animation_type=”0″ animation_direction=”down” animation_speed=”0.1″ alignment=”left” class=”” id=””/]이전에서 ‘Generate a personal token’ 을 클릭하면 아래 그림과 같이 별도의 창(탭)에 Avada token 등록 화면이 나타납니다. Token은 인증코드와 비슷한 것 정도로 알아두시면 됩니다. 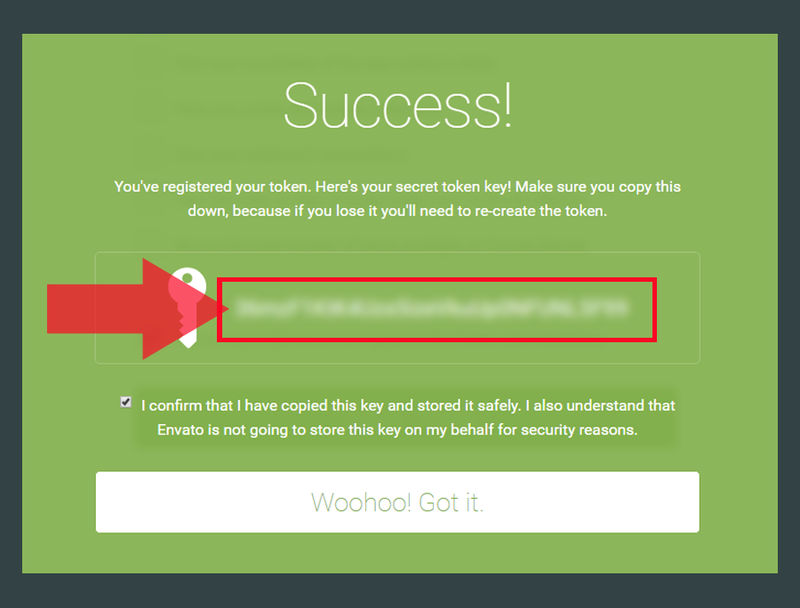 아래 그림처럼 Token name을 하나 입력하시고 아래와 같이 체크를 하신 후 ‘Create Token’을 클릭 합니다. 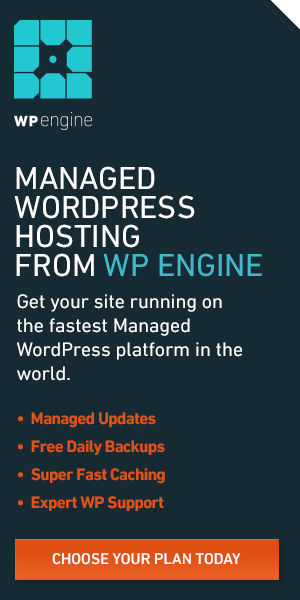 [fusion_fontawesome icon=”fa-chevron-right” circle=”yes” size=”13px” iconcolor=”” circlecolor=”” circlebordercolor=”” rotate=”” spin=”no” animation_type=”0″ animation_direction=”down” animation_speed=”0.1″ alignment=”left” class=”” id=””/]위에서 Copy한 Token key를 아래 그림과 같이 Avada 디자인테마의 Welcome 화면에 붙여 넣습니다. 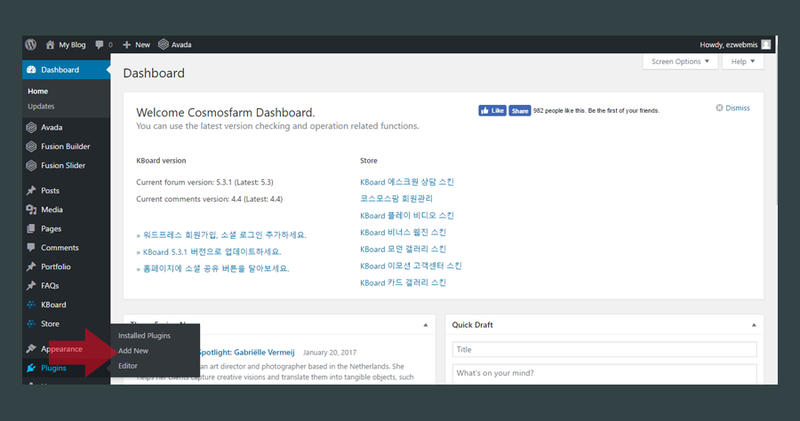 그리고, ‘SUBMIT’을 클릭 합니다. [fusion_fontawesome icon=”fa-chevron-right” circle=”yes” size=”13px” iconcolor=”” circlecolor=”” circlebordercolor=”” rotate=”” spin=”no” animation_type=”0″ animation_direction=”down” animation_speed=”0.1″ alignment=”left” class=”” id=””/]아래 그림 하단과 같이 ‘Congratulations! 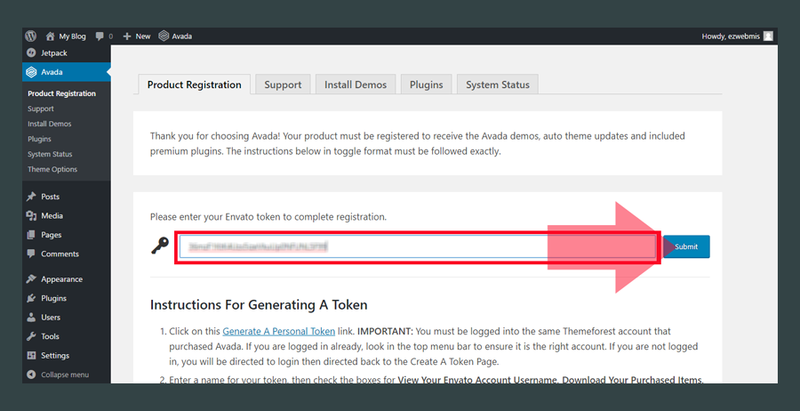 Your product is registered now.’라는 메세지가 나타나는것을 확인 하실 수 있습니다. 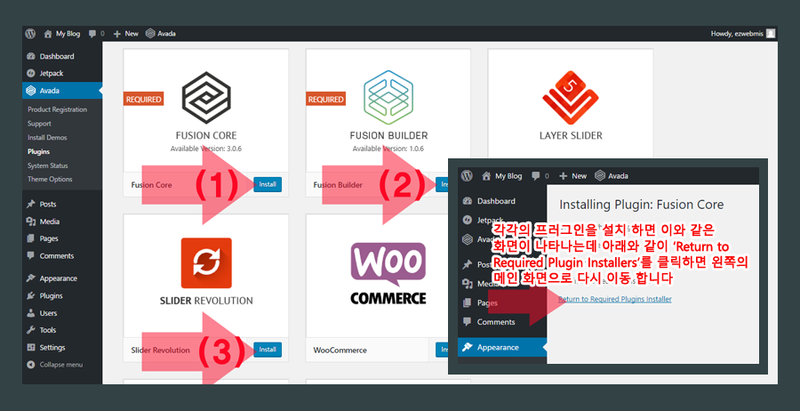 화면 상단의 ‘Go Manage Plugins’를 클릭 합니다. 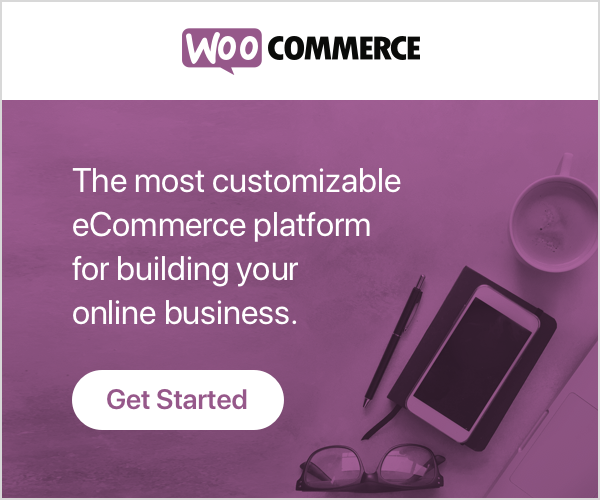 [fusion_fontawesome icon=”fa-chevron-right” circle=”yes” size=”13px” iconcolor=”” circlecolor=”” circlebordercolor=”” rotate=”” spin=”no” animation_type=”0″ animation_direction=”down” animation_speed=”0.1″ alignment=”left” class=”” id=””/]아래 그림처럼 3개의 플러그인을 하나씩 차례로 설치 합니다. 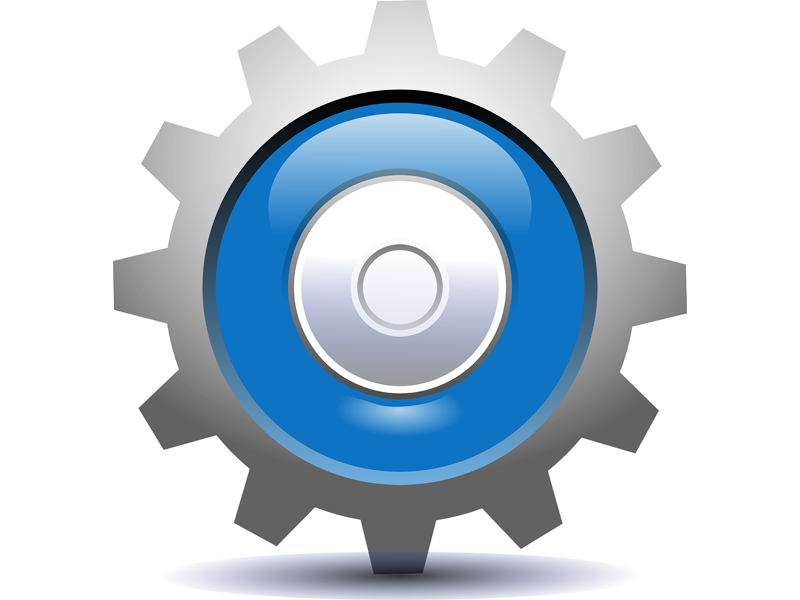 [fusion_fontawesome icon=”fa-chevron-right” circle=”yes” size=”13px” iconcolor=”” circlecolor=”” circlebordercolor=”” rotate=”” spin=”no” animation_type=”0″ animation_direction=”down” animation_speed=”0.1″ alignment=”left” class=”” id=””/]위 화면에서 (1), (2)번의 경우는 Install 을 하면 Activate까지 자동으로 해 주는데 (3)번 SLIDE REVOLUTION 의 경우는 아래 그림과 같이 Install 후 Activate을 한번 더 클릭해 주어야 합니다. 먼저, 관리자 화면으로 로그인 합니다. 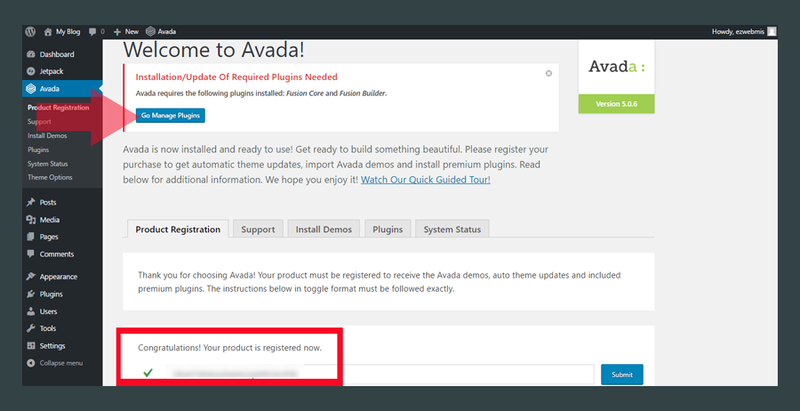 [fusion_fontawesome icon=”fa-chevron-right” circle=”yes” size=”13px” iconcolor=”” circlecolor=”” circlebordercolor=”” rotate=”” spin=”no” animation_type=”0″ animation_direction=”down” animation_speed=”0.1″ alignment=”left” class=”” id=””/]아래 관리자 화면에서 Settings를 클릭 합니다. 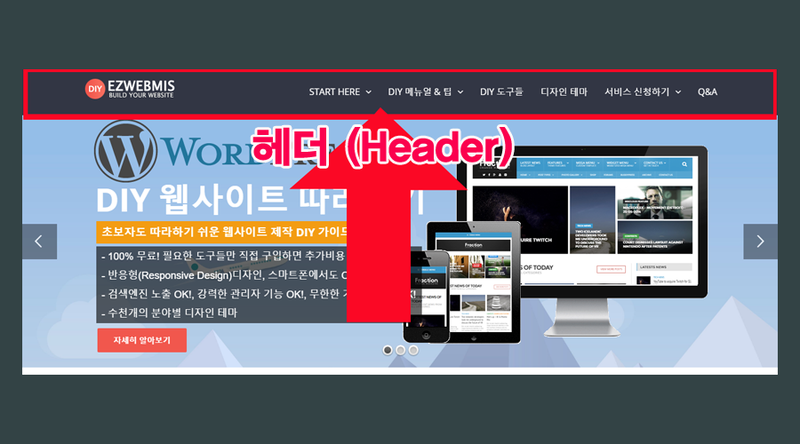 Site Title (필수) : 브라우져 (크롬,파이어폭스등 ….) 의 탭에 나타나는 웹사이트 제목을 입력 합니다. Tagline : 웹사이트를 설명하는 자신만의 특징있는 문장을 입력 합니다. 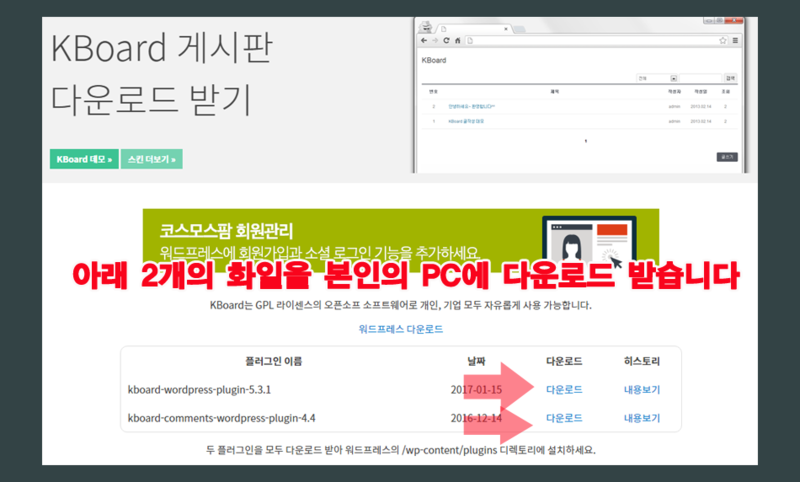 WordPress Address (URL) : 서버에 실제 워드프레스가 설치된 URL 입니다. 처음에는 웹호스팅 회사에서 제공한 URL이 입력 되 있을 수 있습니다. 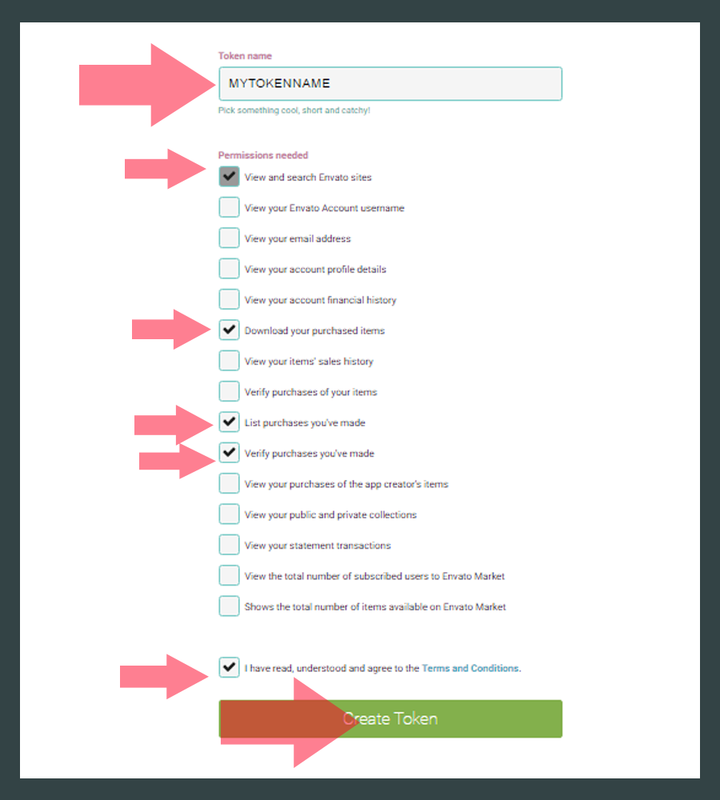 본인의 도메인 이름을 http://mydomain.com 형식으로 입력 하시면 됩니다. 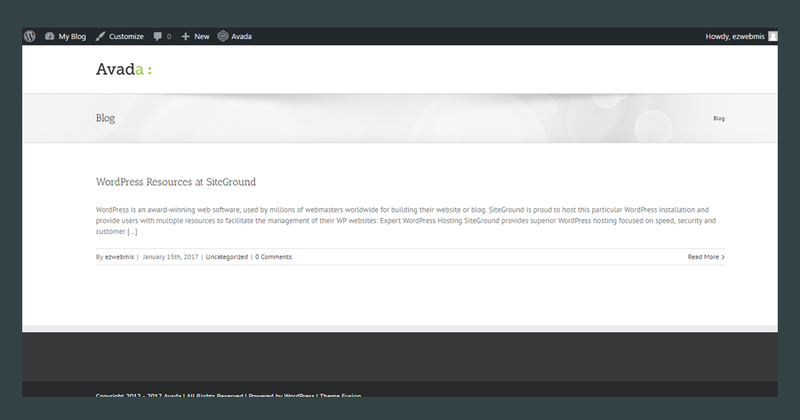 Site Address (URL) (필수) : 사용자들이 인터넷에서 본인의 웹사이트로 연결되기 위한 URL입니다. 본인이 구입한 URL 을 http://mydomain.com ( mydomain.com 은 본인의 도메인 이름 ) 의 형식으로 입력하세요. 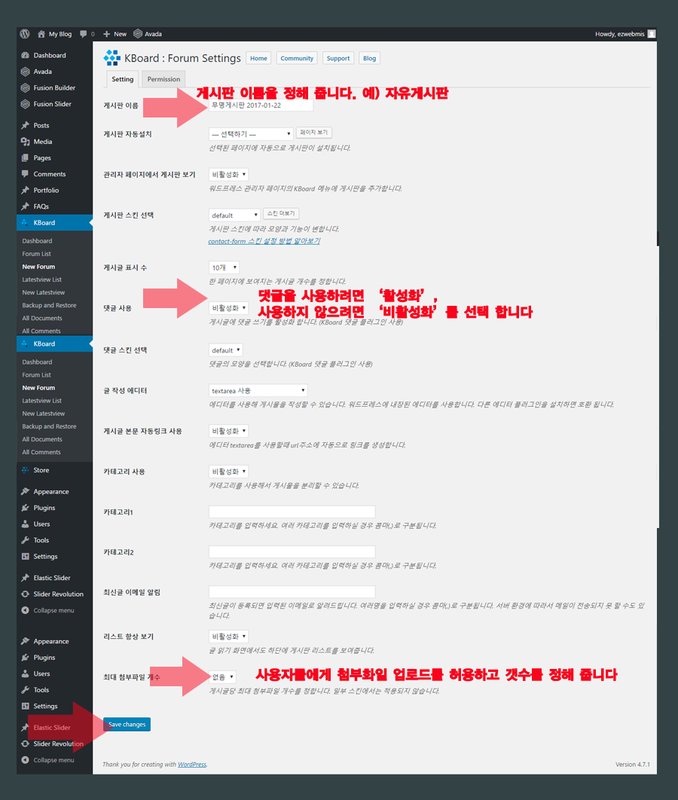 Email (필수) : 웹사이트에서 이메일을 받거나 보낼 때 기본이 되는 이메일을 입력하세요. 예를들어 Contact Us 페이지에서 방문자가 질문을 입력하면 전송되어지는 이메일 주소등을 말합니다. Membership : 회원가입이 가능한 사이트를 만드는 옵션 입니다. 회원가입이 필요 없는 사이트는 체크하지 마시고 그대로 두세요. 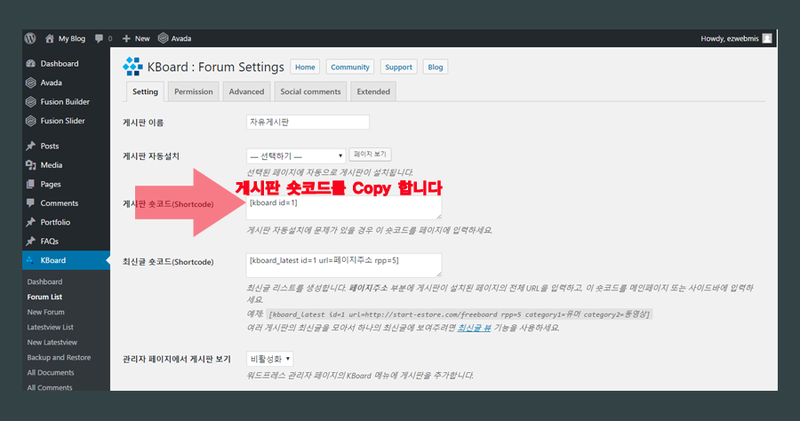 New user default role : 새 회원이 가입 했을때 새 회원의 기본 권한을 자동으로 설정 하는 기능 입니다. 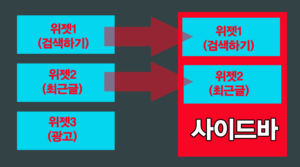 Date Format : 웹사이트에서 날짜를 보여주는 형식을 지정할수 있습니다. Week start on : 일반적으로 월요일로 그대로 두시면 됩니다. 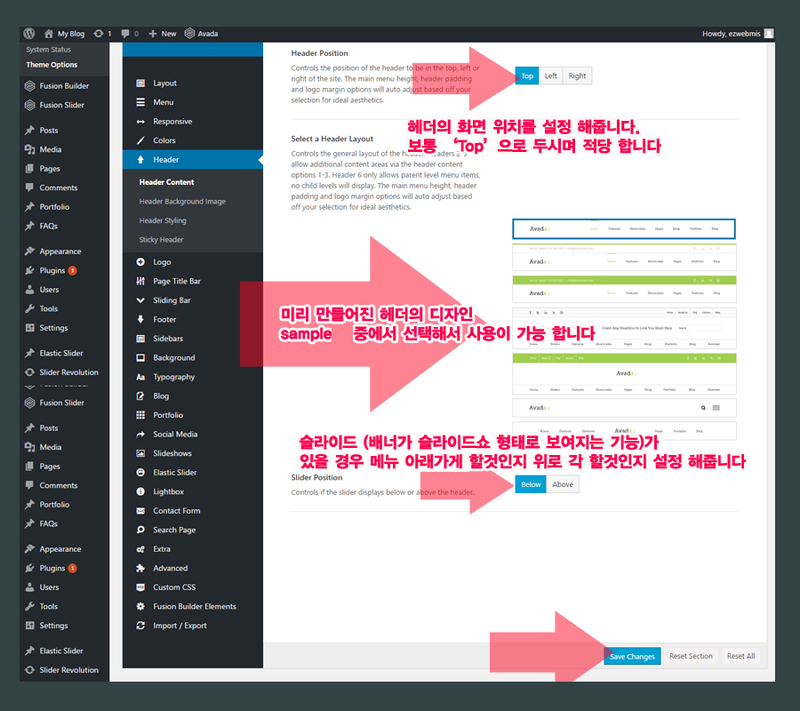 Site Language (필수) : 본인이 원하는 언어를 선택 하세요. 워드프레스는 전세계의 거의 모든 언어를 지원합니다. 처음 워드프레스를 설치하면 기본적으로 영어로 설치가 됩니다. 이 설정을 바꾸면 웹사이트 전체가 선택한 언어로 변경 됩니다. 페이지 만들기는 아래 포스팅을 참조하세요. 아래 포스팅에서는 실제로 5개의 페이지를 만드는 것 까지 만을 알아보고, 페이지를 멋지게 꾸민는 것은 10)에서 자세히 설명드리겠습니다. 메뉴 만들기는 아래 포스팅을 참조하세요. 보통 웹사이트는 보여지는 영역에 따라서 크게 4가지로 구분 할 수 있습니다. 일반적으로 이러한 영역들을 헤더,메인 컨텐츠,사이드바,푸터로 구분 합니다. 일반적인 웹사이트의 경우 헤더와 푸터의 경우는 페이지가 바뀌어도 똑같은 내용을 보여주는것이 일반적입니다, 즉, 한번만 만들어 놓으면 거의 모든 페이지에서 사용되어 진다는 것을 의미합니다. 보통 헤더에는 로고, 메인메뉴, 연락처등이 보여지고, 푸터의경우는 Contact us정보, 메인 메뉴에서 빠진 메뉴들, Copyright 정보등이 보여집니다. 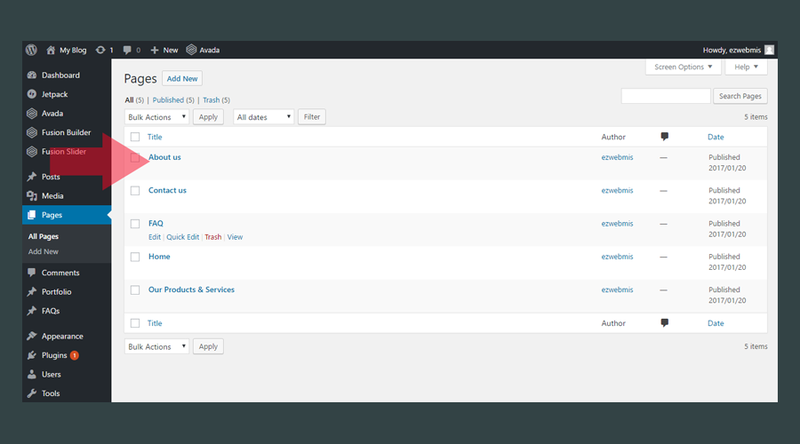 [fusion_fontawesome icon=”fa-chevron-right” circle=”yes” size=”13px” iconcolor=”” circlecolor=”” circlebordercolor=”” rotate=”” spin=”no” animation_type=”0″ animation_direction=”down” animation_speed=”0.1″ alignment=”left” class=”” id=””/]아래 그림과 같이 웹페이지의 상단 부분중 모든 페이지에서 동일하게 보여지는 부분을 헤더(Header)라고 합니다. 일반 적으로 웹사이트 로고(Logo), 메인메뉴등이 보여지게 됩니다. [fusion_fontawesome icon=”fa-chevron-right” circle=”yes” size=”13px” iconcolor=”” circlecolor=”” circlebordercolor=”” rotate=”” spin=”no” animation_type=”0″ animation_direction=”down” animation_speed=”0.1″ alignment=”left” class=”” id=””/]헤더를 만들기 위해서는 우리가 사용중인 Avada 디자인 테마의 ‘Theme options’로 이동 합니다. 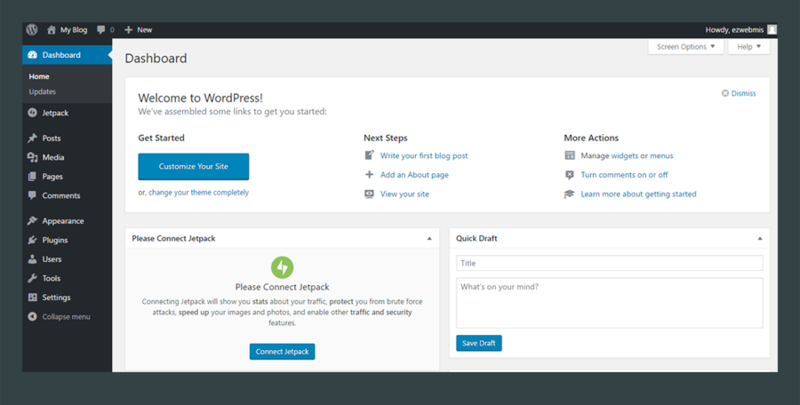 [fusion_fontawesome icon=”fa-chevron-right” circle=”yes” size=”13px” iconcolor=”” circlecolor=”” circlebordercolor=”” rotate=”” spin=”no” animation_type=”0″ animation_direction=”down” animation_speed=”0.1″ alignment=”left” class=”” id=””/]아래와 같이 Header Position은 Top으로 유지 합니다. 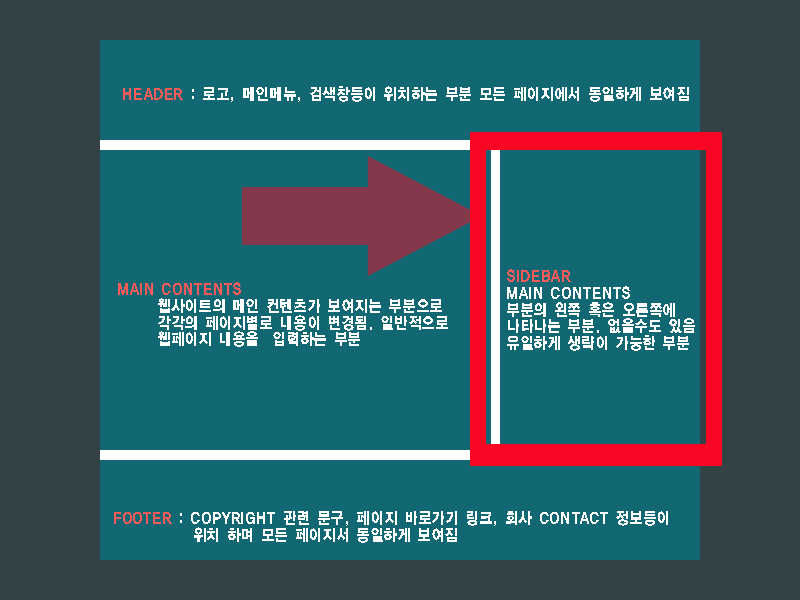 Header Layout 여러분이 보시고 가장 마음에 드는 것으로 선택하시면 됩니다. 선택을 하신 후에는 화면 하단의 Save Changes를 클릭 하신 후 실제로 웹사이트를 열어서 어떻게 보이는지 확인해 보세요. 선택된 Layout이 마음에 들지 않으면 다시 변경 하고 Save Changes를 클릭 하면 됩니다. 항상 무엇인가를 변경하신 후에는 Save Changes를 클릭 하세요! 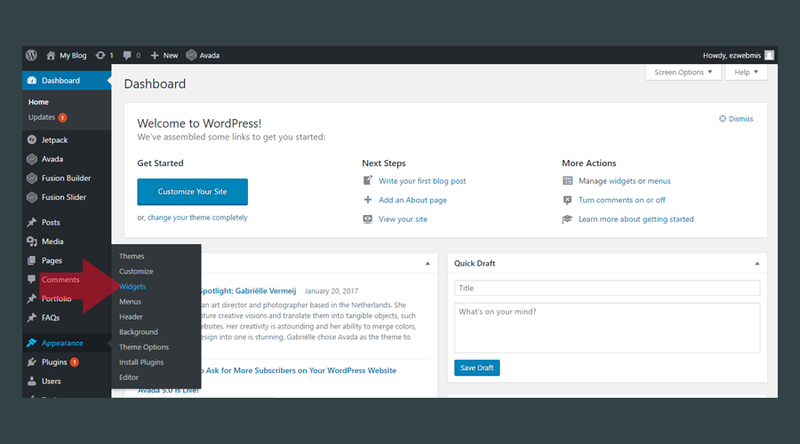 [fusion_fontawesome icon=”fa-chevron-right” circle=”yes” size=”13px” iconcolor=”” circlecolor=”” circlebordercolor=”” rotate=”” spin=”no” animation_type=”0″ animation_direction=”down” animation_speed=”0.1″ alignment=”left” class=”” id=””/]헤더에 백그라운드 이미지를 넣어 줄 수 있습니다. 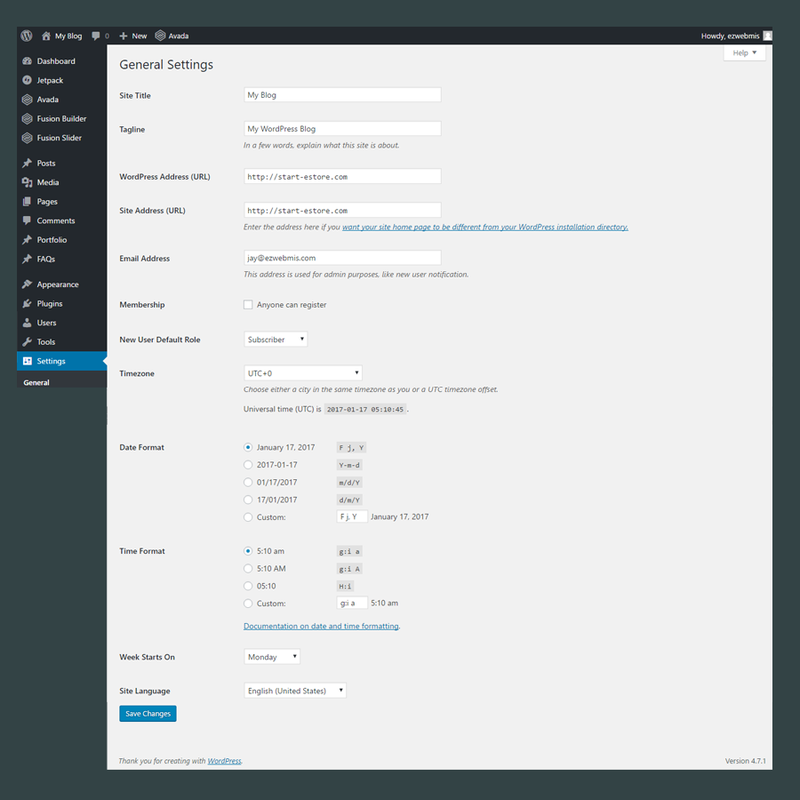 [fusion_fontawesome icon=”fa-chevron-right” circle=”yes” size=”13px” iconcolor=”” circlecolor=”” circlebordercolor=”” rotate=”” spin=”no” animation_type=”0″ animation_direction=”down” animation_speed=”0.1″ alignment=”left” class=”” id=””/]Header styling 을 클릭해서 아래와 같이 스타일을 설정 해줍니다. 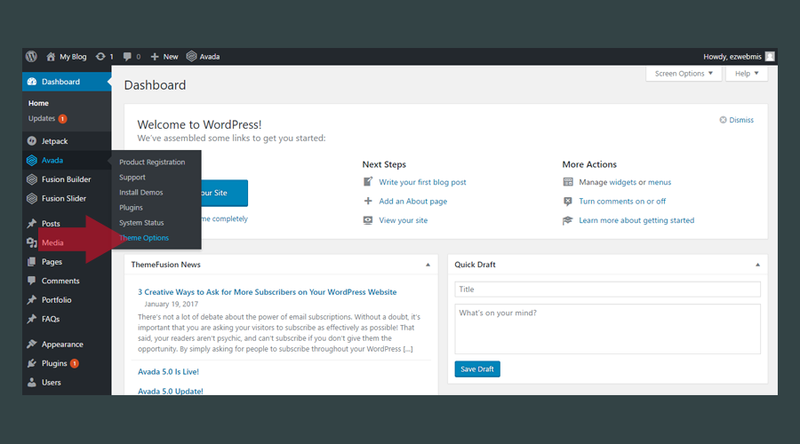 [fusion_fontawesome icon=”fa-chevron-right” circle=”yes” size=”13px” iconcolor=”” circlecolor=”” circlebordercolor=”” rotate=”” spin=”no” animation_type=”0″ animation_direction=”down” animation_speed=”0.1″ alignment=”left” class=”” id=””/]Sticky Header 설정을 해줍니다. 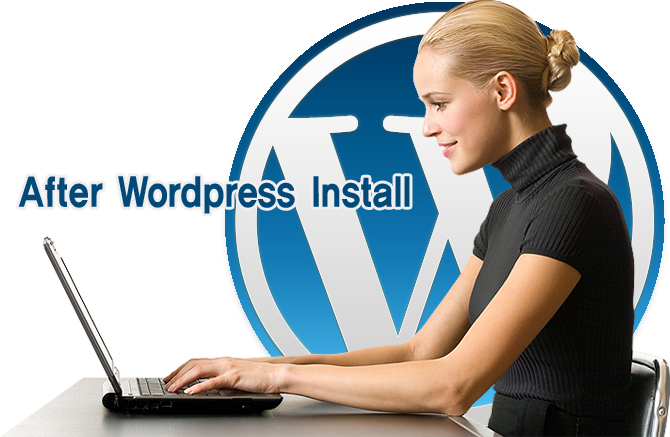 [fusion_fontawesome icon=”fa-chevron-right” circle=”yes” size=”13px” iconcolor=”” circlecolor=”” circlebordercolor=”” rotate=”” spin=”no” animation_type=”0″ animation_direction=”down” animation_speed=”0.1″ alignment=”left” class=”” id=””/]Theme Options > Logo로 이동 합니다. 아래 그림과 같이 로고를 설정 해줍니다. [fusion_fontawesome icon=”fa-chevron-right” circle=”yes” size=”13px” iconcolor=”” circlecolor=”” circlebordercolor=”” rotate=”” spin=”no” animation_type=”0″ animation_direction=”down” animation_speed=”0.1″ alignment=”left” class=”” id=””/]Theme Options > Logo > Favicon 으로 이동 합니다. 아래 그림과 같이 파비콘을 설정 해줍니다. 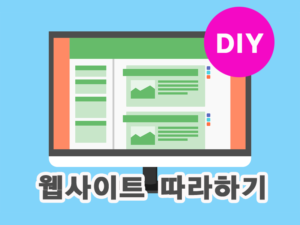 파비콘(Favicon)이란? 웹브라우져의 탭의 왼쪽에 나타나는 웹사이트 고유의 아이콘 입니다. 보통 24×24, 16×16 픽셀 사이즈의 아이콘을 말합니다. 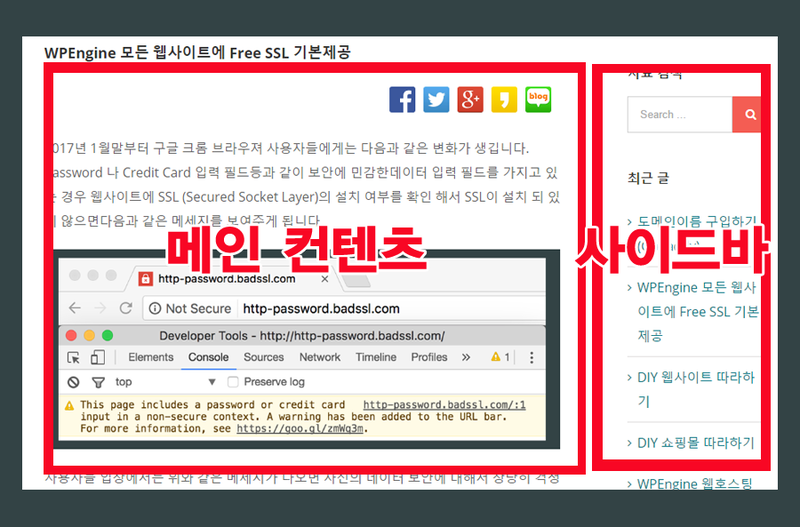 http://www.favicon-generator.org/ 에서 Free로 만드실 수도 있고, 직접 만드셔도 됩니다. [fusion_fontawesome icon=”fa-chevron-right” circle=”yes” size=”13px” iconcolor=”” circlecolor=”” circlebordercolor=”” rotate=”” spin=”no” animation_type=”0″ animation_direction=”down” animation_speed=”0.1″ alignment=”left” class=”” id=””/]푸터는 헤더와 마찬가지로 모든 페이지에서 동일하게 보이게 됩니다. 그리고, 화면 가장 아래 부분에 위치 하게 됩니다. 보통 메인 메뉴이외의 페이지 링크, Contact 정보, 최근글 혹은 제품 2~3개정도를 보여주게 됩니다. 그리고, 화면 가장 하단에는 Copyright 문구를 넣는 것이 일반 적입니다. 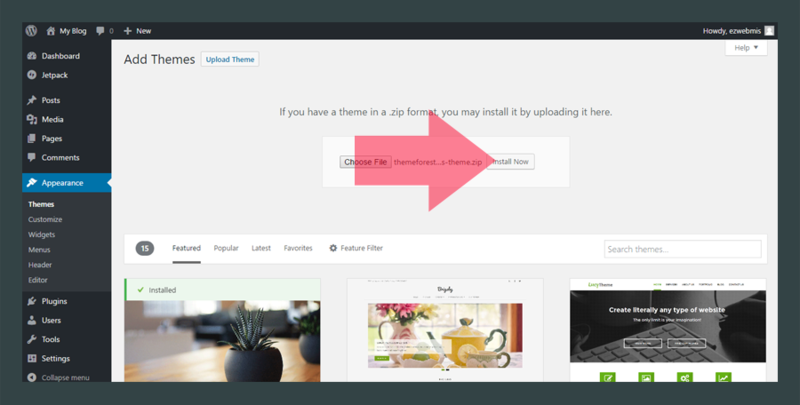 [fusion_fontawesome icon=”fa-chevron-right” circle=”yes” size=”13px” iconcolor=”” circlecolor=”” circlebordercolor=”” rotate=”” spin=”no” animation_type=”0″ animation_direction=”down” animation_speed=”0.1″ alignment=”left” class=”” id=””/]Avada > Theme Options > Footer > Footer Contents를 클릭 합니다. 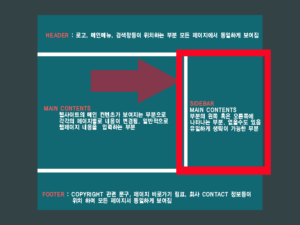 Footer Parallax Effect : 푸터의 위치를 항상 고정 시키고 스크롤을 아래로 하면 푸터가 위에서 내려온 컨텐츠에 덮히는 효과를 나타내줌. 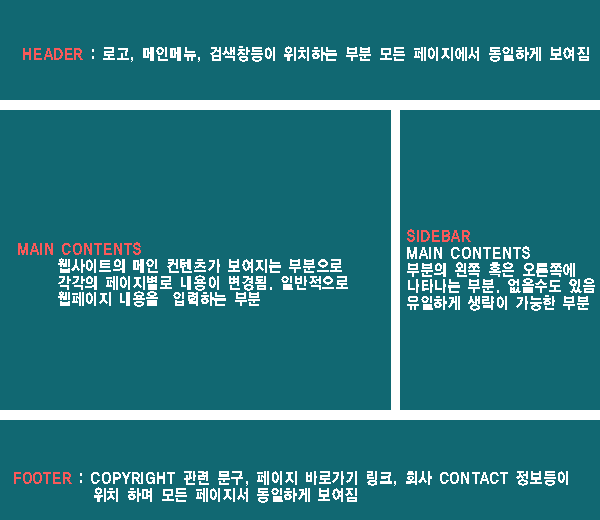 Parallax Background Image : 푸터의 배경 이미지의 위치를 항상 고정 시키고 스크롤을 아래로 하면 푸터 배경 이미지가가 위에서 내려온 컨텐츠에 덮히는 효과를 나타내줌. 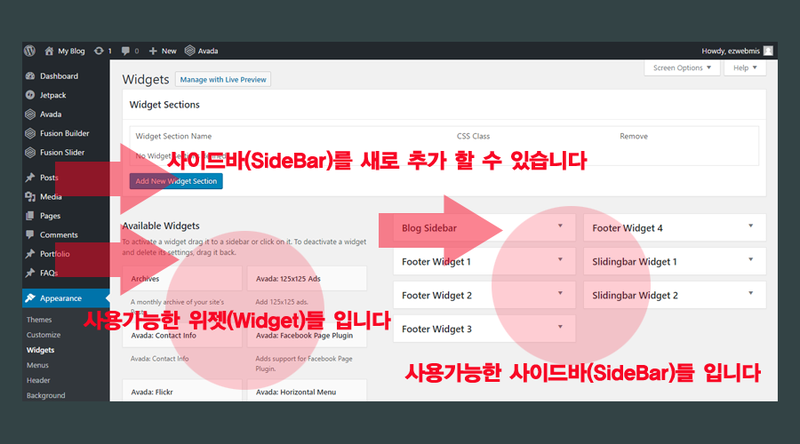 Sticky Footer : 푸터의 위치를 위 헤더에서 설명한 Sticky Header 처럼 항상 화면 하단에 보이도록 하는 효과를 나타네줌. 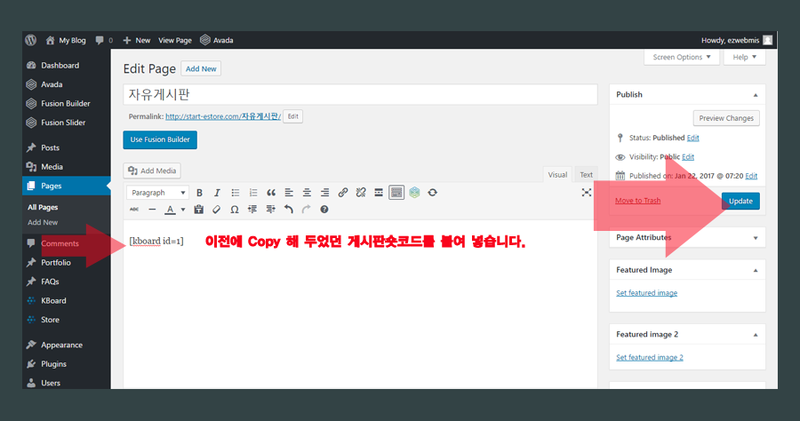 Sticky Footer and Parallax Background Image : 푸터의 배경 그림은 항상 같은 위치에 있고 푸터 컨텐츠만이 스크롤되는 효과를 줌. Copyright Bar를 보여줄지 말지 설정이 가능 합니다. 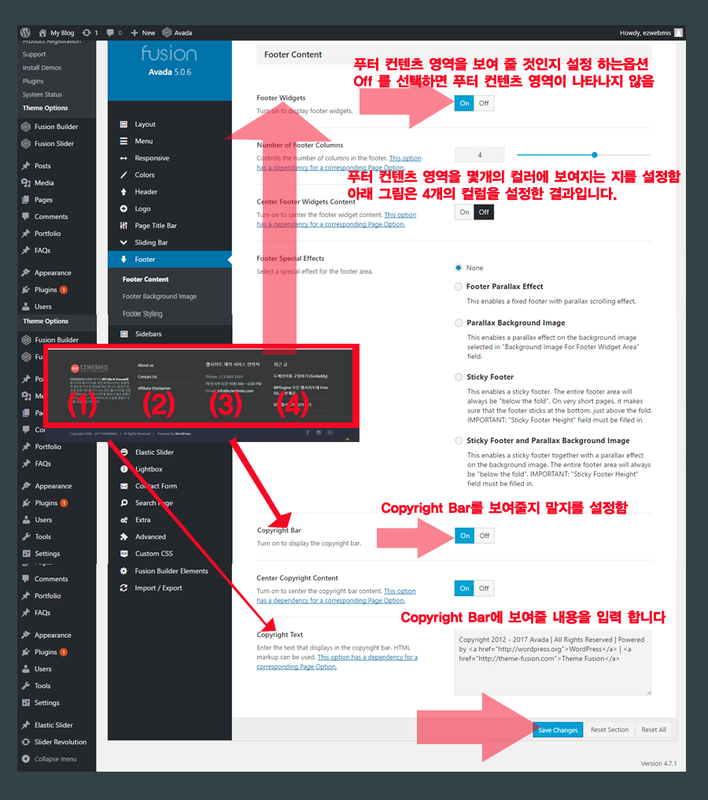 Copyright에 보여줄 내용을 직접 입력 가능 합니다. [fusion_fontawesome icon=”fa-chevron-right” circle=”yes” size=”13px” iconcolor=”” circlecolor=”” circlebordercolor=”” rotate=”” spin=”no” animation_type=”0″ animation_direction=”down” animation_speed=”0.1″ alignment=”left” class=”” id=””/]Avada > Theme Options > Footer > Footer Background Image를 클릭 합니다. 아래 그림과 같이 푸터 배경 이미지를 업로드 하실 수 있습니다. 여기서 업로드된 이미지는 푸터 컨텐츠 영역에 보여지게 됩니다. ‘100% Background Image’를 On 하시면 이미지의 사이즈에 상관없이 푸터의 컨텐츠 영역을 꽉채워 줍니다. 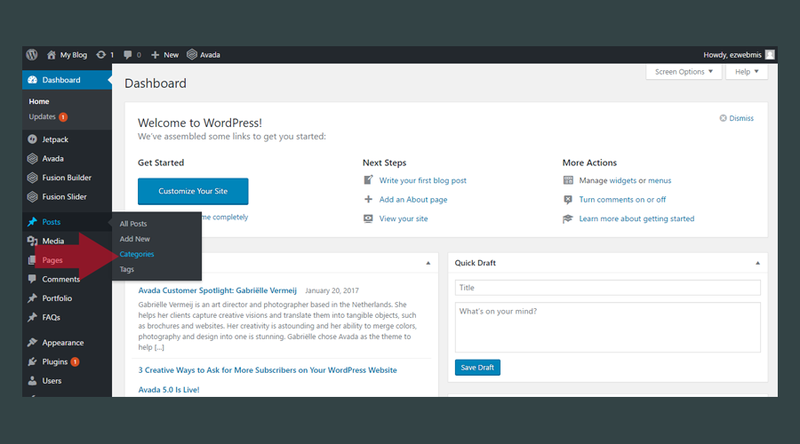 [fusion_fontawesome icon=”fa-chevron-right” circle=”yes” size=”13px” iconcolor=”” circlecolor=”” circlebordercolor=”” rotate=”” spin=”no” animation_type=”0″ animation_direction=”down” animation_speed=”0.1″ alignment=”left” class=”” id=””/]Avada > Theme Options > Footer > Footer Styling를 클릭 합니다. 푸터 부분을 아래 그림과 같이 아주 세밀하게 설정이 기능 합니다. 자세한 설정 방법은 아래 그림을 참조하세요. 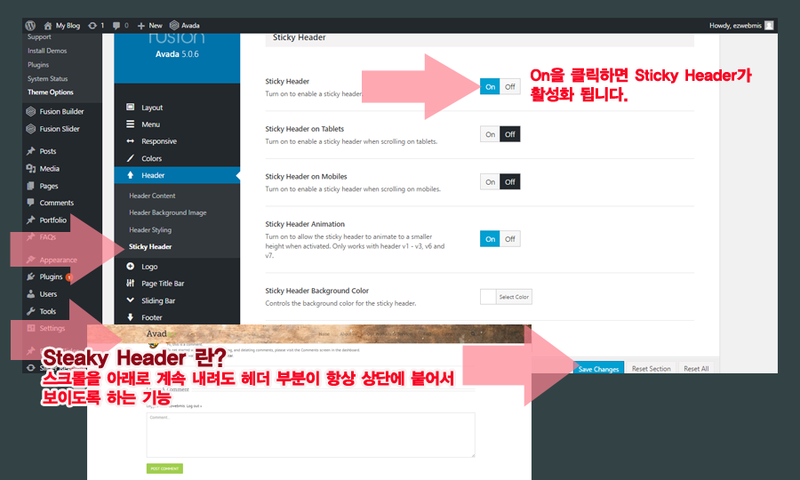 사이드바 (Sidebar)란? 웹사이트 메인 컨텐츠의 왼쪽 혹은 오른쪽에 위치하며 메인 컨텐츠에 따라서 공통적으로 보이는 부분들을 보여주는 영역 입니다. 일반적으로 서브 메뉴, 최근글 리스트, 검색창, 광고등이 올 수 있으며, 페이지의 내용별로 사이드바를 별도로 지정하 실 수도 있습니다. 사이드바는 경우에 따라서 보이지 않게 하기도 합니다. 사이드바를 만들기 전에 한가지 먼저 알아 두셔야 할 것이 있습니다. 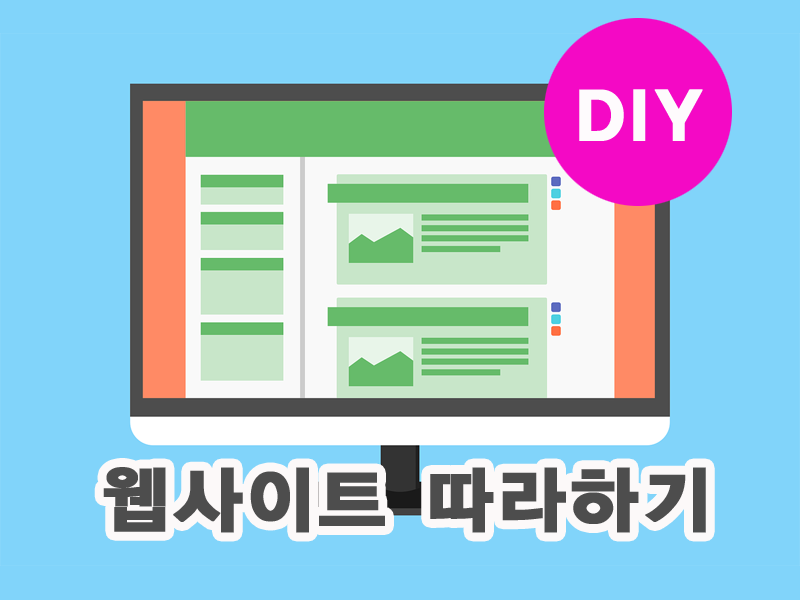 바로 위젯 (Widget) 이라는 것입니다. 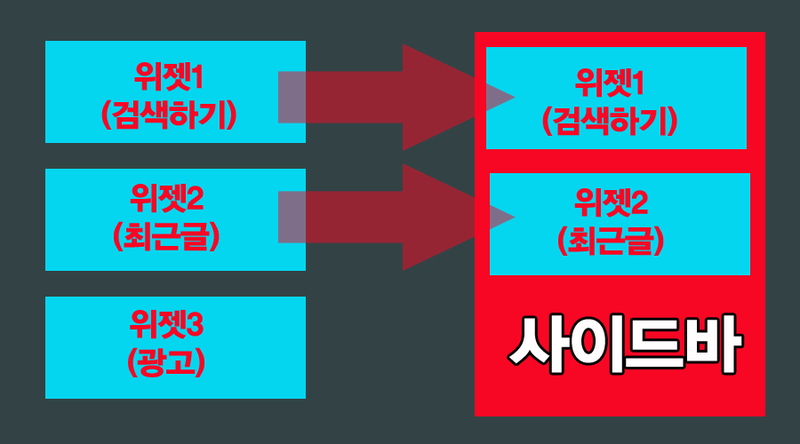 위젯은 사이드바에 쉽게 끼워 넣을 수 있는 웹사이트 컨텐츠의 덩어리 입니다. 즉, 사이드바에 위젯을 하나 혹은 여러개를 끼워넣어서 원하는 컨텐츠 영역을 만들 수 있습니다. 이런 위젯들은 이미 기본적으로 제공되는 것 들도 있고 Avada 디자인테마같이 유료 디자인테마를 구입하면 추가적으로 제공되는 것들도 있습니다. 이러한 위젯을 통해서 웹사이트를 보다 Active하고 Unique하게 꾸미 실 수 있습니다. 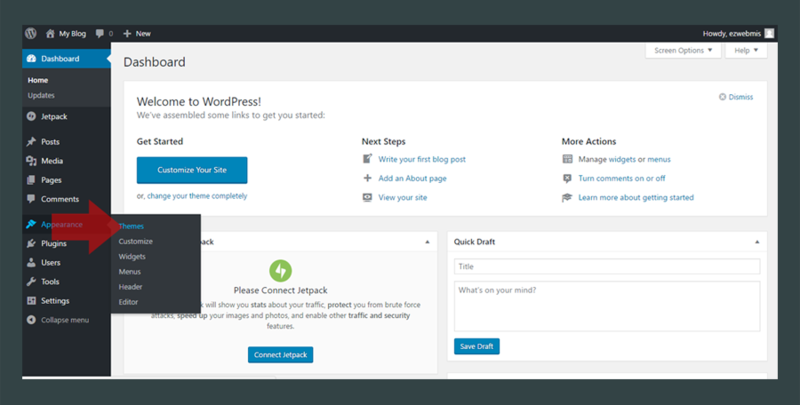 [fusion_fontawesome icon=”fa-chevron-right” circle=”yes” size=”13px” iconcolor=”” circlecolor=”” circlebordercolor=”” rotate=”” spin=”no” animation_type=”0″ animation_direction=”down” animation_speed=”0.1″ alignment=”left” class=”” id=””/]Avada > Appearance > Widgets 을 클릭 합니다. 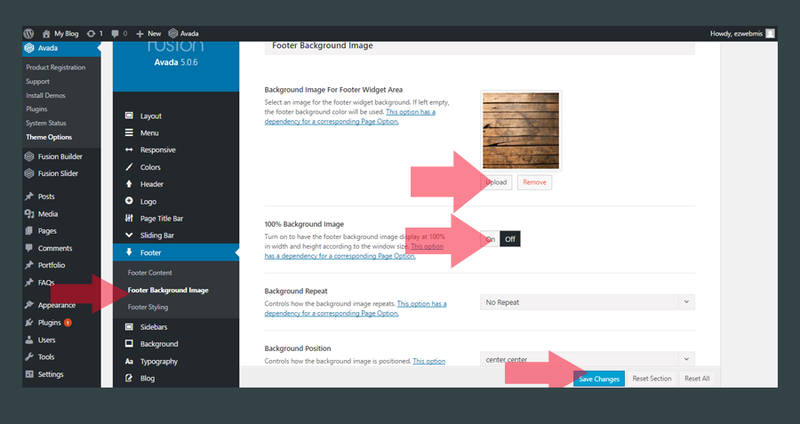 [fusion_fontawesome icon=”fa-chevron-right” circle=”yes” size=”13px” iconcolor=”” circlecolor=”” circlebordercolor=”” rotate=”” spin=”no” animation_type=”0″ animation_direction=”down” animation_speed=”0.1″ alignment=”left” class=”” id=””/]아래 그림과 같이 사이드바와 위젯은 밀접한 관계가 있기 때문에 한 화면에서 관리를 합니다. 필요 따라서 사이드바를 추가로 만들 수 있습니다. 보통은 이미 만들어져 있는 사이드바를 사용합니다. 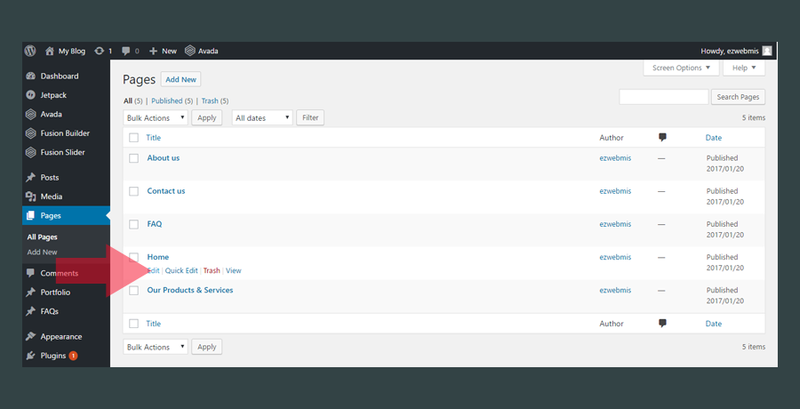 아래 그림에서 보면 이전 프터에서 알아봤던 푸터 컨텐츠 영역을 위한 사이드바 4개 (Footer Widget1, Footer Widget2, Footer Widget3, Footer Widget4)가 이미 만들어져 있음을 알 수 있습니다. 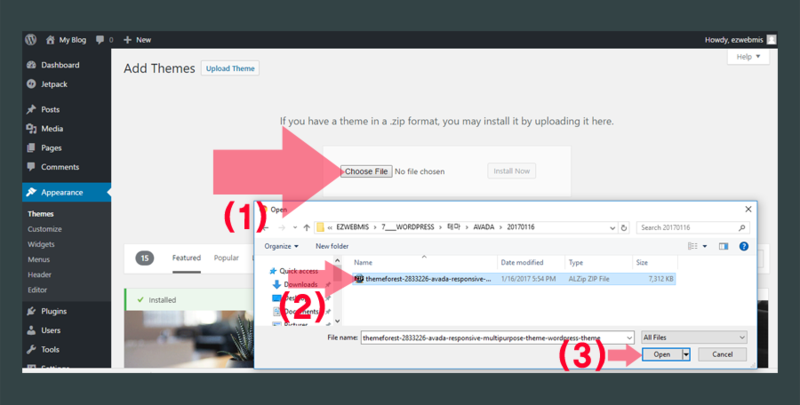 [fusion_fontawesome icon=”fa-chevron-right” circle=”yes” size=”13px” iconcolor=”” circlecolor=”” circlebordercolor=”” rotate=”” spin=”no” animation_type=”0″ animation_direction=”down” animation_speed=”0.1″ alignment=”left” class=”” id=””/]아래 그림과 같이 Archive라는 위젯을 Drag & Drop방식을 통해서 Blog라는 사이드바에 넣어줄 수 있습니다. 사이드바에는 여러개의 위젯을 넣어 줄 수 있고 Drag & Drop방식을 통해서 순서를 정해 줄 수 있습니다. 각각의 위젯을 사이드바로 이동한 후에는 위젯의 설정을 해줄 수 있습니다. [fusion_fontawesome icon=”fa-chevron-right” circle=”yes” size=”13px” iconcolor=”” circlecolor=”” circlebordercolor=”” rotate=”” spin=”no” animation_type=”0″ animation_direction=”down” animation_speed=”0.1″ alignment=”left” class=”” id=””/]아래 그림과 같이 개별 페이지별로 설정을 다르게 할 수 있습니다. 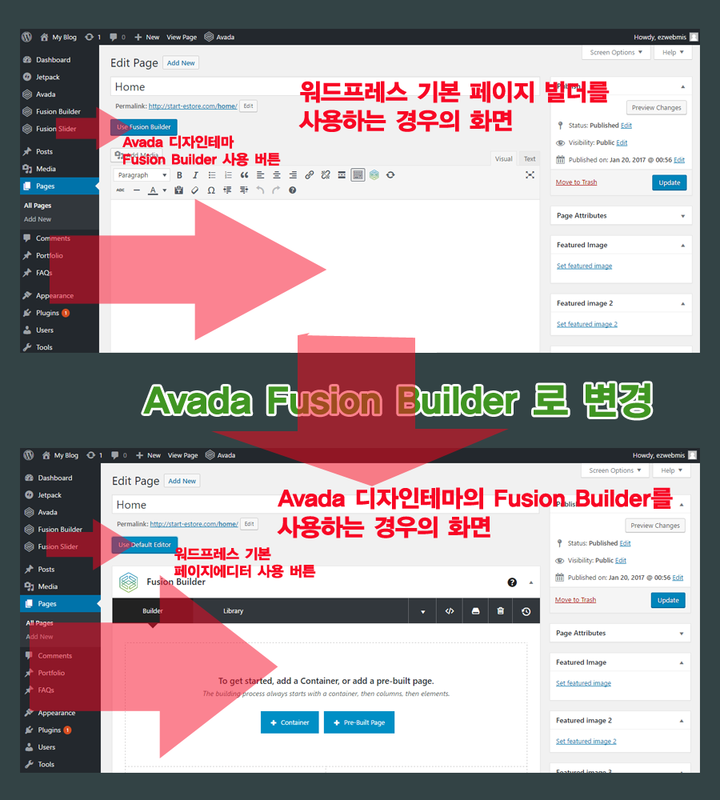 설정을 마치신 후에는 반드시 화면 상단으로 스크롤하셔서 우측에 있는 ‘Publish’ 혹은 ‘Update’ 버튼을 클릭 하세요. 블로그는 웹사이트를 마케팅 하기위한 가장 유용한 방법중 하나입니다. 워드프레스의 경우는 이러한 블로그를 만들고 관리하는데 특화되 있습니다. 그리고, 워드프레스 블로그의 경우는 검색엔진에서 잘 노출 되도록 개발이 되있습니다. 블로그만 잘 관리해도 여러분의 웹사이트에 방문자가 늘어나는것을 직접 경험 하실 수 있습니다. 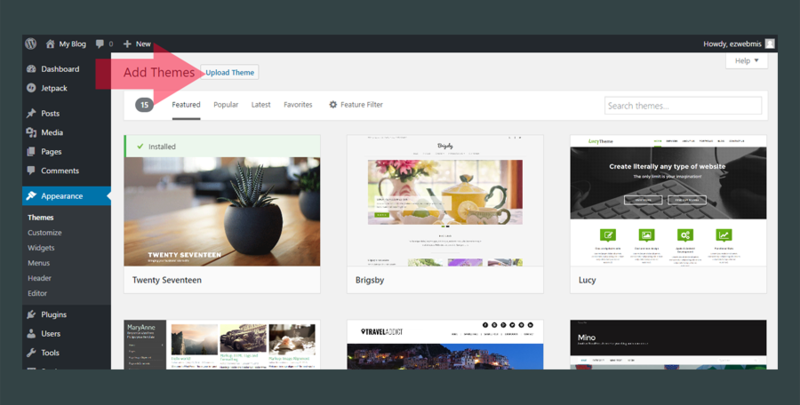 [fusion_fontawesome icon=”fa-chevron-right” circle=”yes” size=”13px” iconcolor=”” circlecolor=”” circlebordercolor=”” rotate=”” spin=”no” animation_type=”0″ animation_direction=”down” animation_speed=”0.1″ alignment=”left” class=”” id=””/]블로그는 글의 내용에 따라서 별도의 카테고리별로 구분 할 수 있습니다. 카테고리별로 구분을 해 놓으면 향후에 검색 과 관리가 편리합니다. 미리 카테고리 내용을 정해줄 수도 있고 글(Post)을 작성 하면서 카테고리를 추가 할 수도 있습니다. 여기서는 미리 카테고리를 정하는 방법에 대해서 설명 드리겠습니다. Posts > Categories로 이동 합니다. 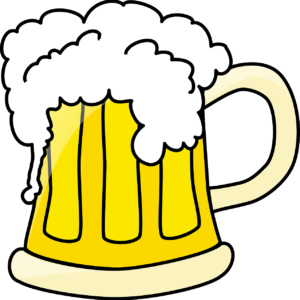 [fusion_fontawesome icon=”fa-chevron-right” circle=”yes” size=”13px” iconcolor=”” circlecolor=”” circlebordercolor=”” rotate=”” spin=”no” animation_type=”0″ animation_direction=”down” animation_speed=”0.1″ alignment=”left” class=”” id=””/]아래와 같이 새로운 카테고리를 만들거나 이미 만들어진 카테고리를 수정하거나 삭제 할 수 있습니다. 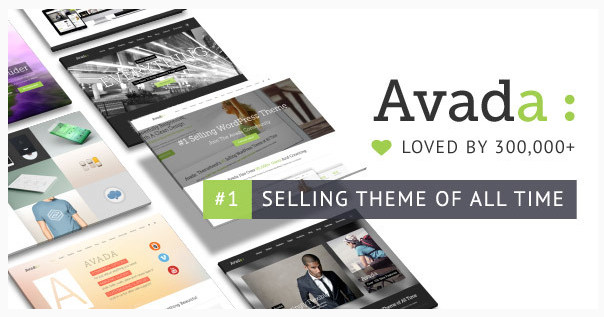 [fusion_fontawesome icon=”fa-chevron-right” circle=”yes” size=”13px” iconcolor=”” circlecolor=”” circlebordercolor=”” rotate=”” spin=”no” animation_type=”0″ animation_direction=”down” animation_speed=”0.1″ alignment=”left” class=”” id=””/]블로그 글 작성 방법은 다음과 같습니다. Posts > Add New를 클릭 합니다. 내용을 입력 합니다. 만약 이미지를 추가 하려면 왼쪽 상단에 있는 ‘Add Media’ 버튼을 클릭한 후 이미지를 업로드 합니다. 내용 입력 창은 아주 편리하게 사용이 가능 합니다. 예를들어 Youtube 비디오의 경우 주소만 copy & paste하면 자동으로 비디오를 추가 해줍니다. 카테고리를 선택해 줍니다. 만약 원하는 카테고리가 없으면 ‘ Add New Category’를 클릭해서 새로운 카테고리를 직접 만들 수 있습니다. Feature Image를 클릭해서 글이 리스트 될때 보여질 대표 이미지를 입력 합니다. Publish를 클릭해서 작성한 내용을 저장 해줍니다. 아래 그림 하단에서 볼 수 있듯이 Avada 디자인테마를 사용하면 기본적으로 글 작성 할 때 제공되는 옵션보다 훨씬 다양한 옵션들이 제공 됩니다. 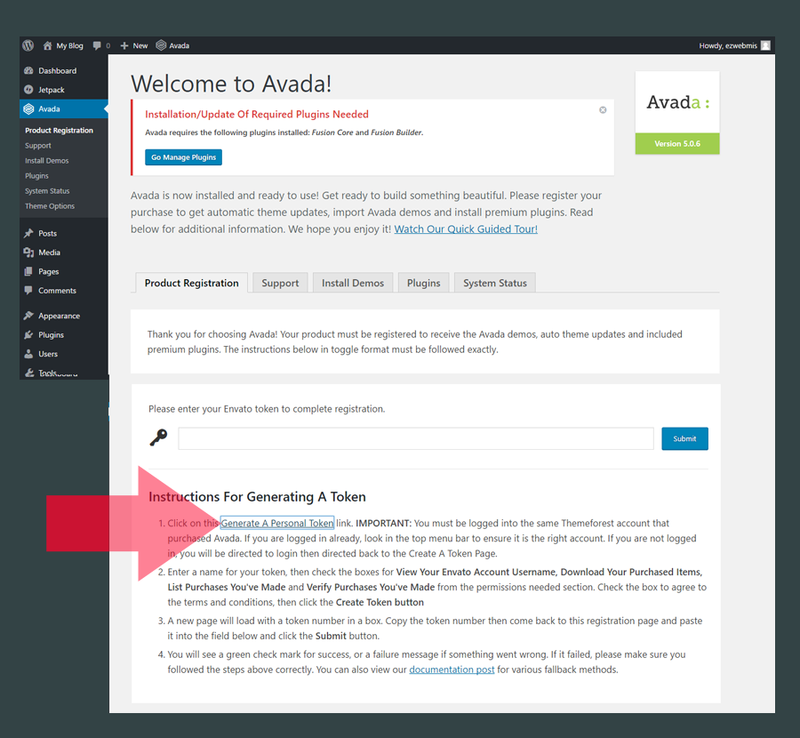 [fusion_fontawesome icon=”fa-chevron-right” circle=”yes” size=”13px” iconcolor=”” circlecolor=”” circlebordercolor=”” rotate=”” spin=”no” animation_type=”0″ animation_direction=”down” animation_speed=”0.1″ alignment=”left” class=”” id=””/]블로그의 내용은 워드프레스 기본 에디터를 사용해서 작성하게 됩니다. 아래 그림은 대략적인 기본 에디터의 사용 방법입니다. 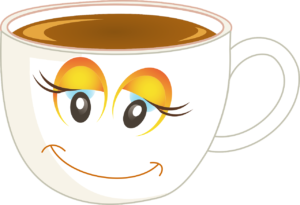 [fusion_fontawesome icon=”fa-chevron-right” circle=”yes” size=”13px” iconcolor=”” circlecolor=”” circlebordercolor=”” rotate=”” spin=”no” animation_type=”0″ animation_direction=”down” animation_speed=”0.1″ alignment=”left” class=”” id=””/]이미 우리가 만들어 놓은 Home 페이지를 오픈 합니다. 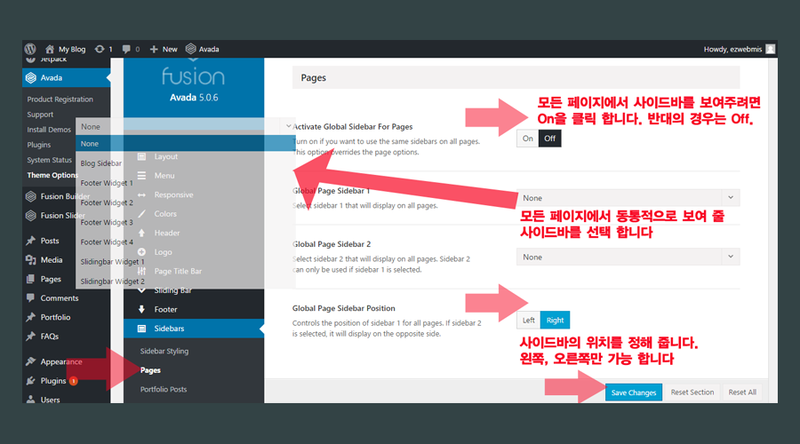 Pages > All Pages > Home을 선택 합니다. 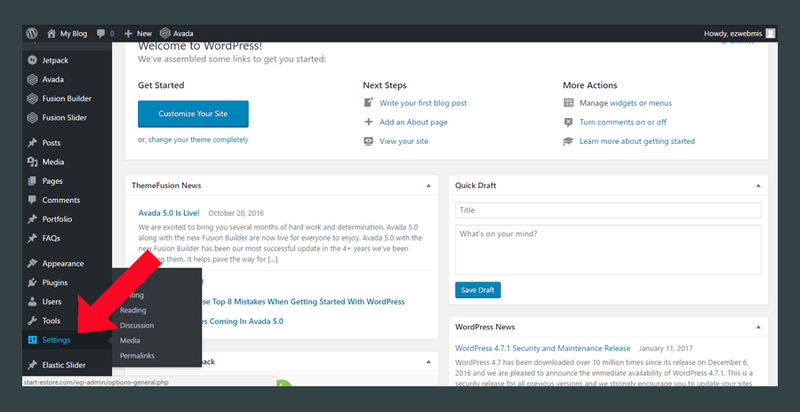 [fusion_fontawesome icon=”fa-chevron-right” circle=”yes” size=”13px” iconcolor=”” circlecolor=”” circlebordercolor=”” rotate=”” spin=”no” animation_type=”0″ animation_direction=”down” animation_speed=”0.1″ alignment=”left” class=”” id=””/]아래 그림처럼 워드프레스 기본 에디터로 기본 선택이 되있으면 Avada Fusion Builder로 변경 합니다. [fusion_fontawesome icon=”fa-chevron-right” circle=”yes” size=”13px” iconcolor=”” circlecolor=”” circlebordercolor=”” rotate=”” spin=”no” animation_type=”0″ animation_direction=”down” animation_speed=”0.1″ alignment=”left” class=”” id=””/]Fusion Builder를 사용하는 방법은 아래와 같습니다. Container를 클릭해서 컨텐츠를 만들 영역을 만들어 줍니다. 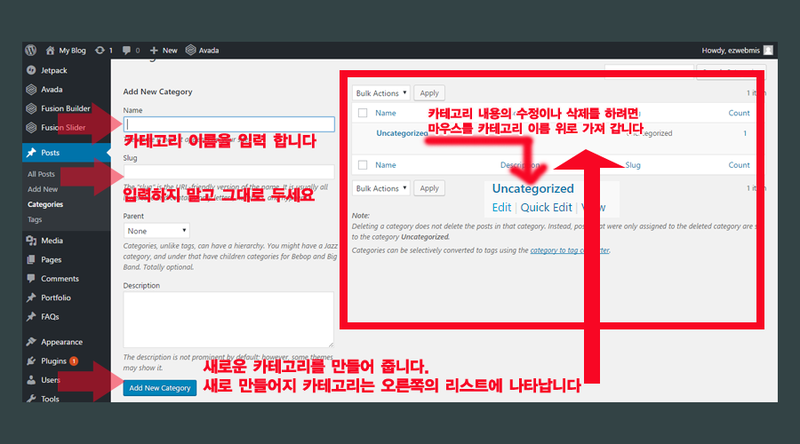 Container가 어떤 컬럼(Column)의 조합으로 만들어 질 것인지 선택해 줍니다. 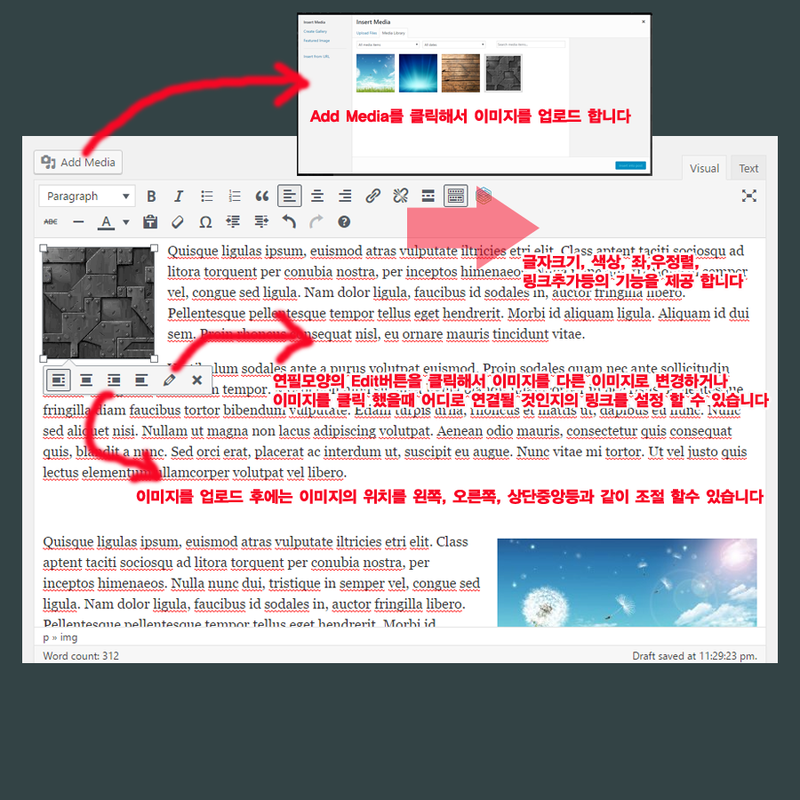 각각의 컬럼(Column)에 있는 Add Element를 클릭해서 컨텐츠 Element 선택창을 오픈해 줍니다. 컨텐츠 Element 선택 창에서 원하는 컨텐츠 Element를 선택 합니다. 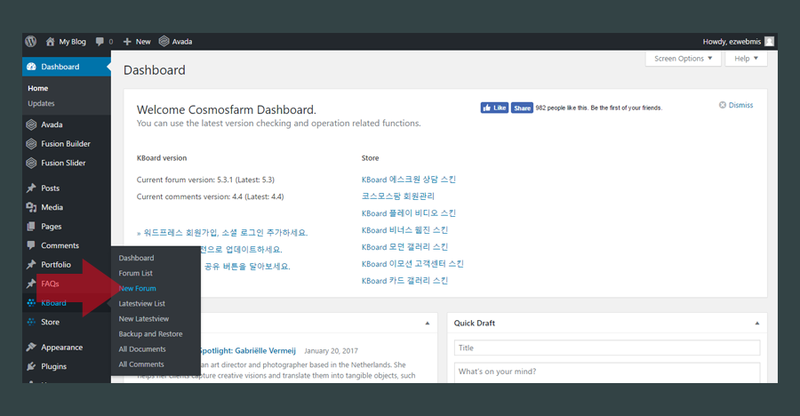 컨텐츠 Element 설정창을 통해서 컨텐츠 Element를 원하는 형태로 만들어 줍니다. 위 순서를 반복해서 원하는 컨텐츠 Element를 원하는 컬럼에 추가 해줍니다. [fusion_fontawesome icon=”fa-chevron-right” circle=”yes” size=”13px” iconcolor=”” circlecolor=”” circlebordercolor=”” rotate=”” spin=”no” animation_type=”0″ animation_direction=”down” animation_speed=”0.1″ alignment=”left” class=”” id=””/]Fusion Builder에서 사용 가능한 컨텐츠 Element들은 다음과 같습니다. 각각의 컨텐츠 Element들은 설정 방법이 조금씩 다릅니다. 그러나, 하나씩 직접 적용해 보면서 본인의 요구에 맞는 설정을 찾아나가다 보면 어렵지 않게 원하는 결과를 얻을 수 있을것이라 생각됩니다. 전세계적으로 운영되는 웹사이트들은 대부분 정보를 제공하는 기본적인 도구로 블로그(Blog) 형태를 사용합니다. 그러나, 가끔 한국적인 포털(Portal)사이트에 익숙한 사용자들을 위해서 한국형 게시판을 제공해야 할 필요가 있을때가 있습니다. 이러한 요구 사항에 부합하기 위해서는 몇가지 플러그인을 설치 해야만 합니다. 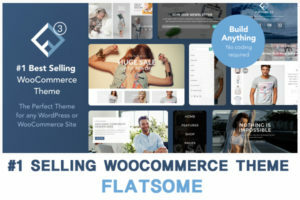 [fusion_fontawesome icon=”fa-external-link” circle=”yes” size=”13px” iconcolor=”” circlecolor=”” circlebordercolor=”” rotate=”” spin=”no” animation_type=”0″ animation_direction=”down” animation_speed=”0.1″ alignment=”left” class=”” id=””/]한국형 게시판 KBOARD 다운로드 에서 KBOARD 플러그인을 다운로드 합니다. [fusion_fontawesome icon=”fa-chevron-right” circle=”yes” size=”13px” iconcolor=”” circlecolor=”” circlebordercolor=”” rotate=”” spin=”no” animation_type=”0″ animation_direction=”down” animation_speed=”0.1″ alignment=”left” class=”” id=””/]아래 그림처럼 게시판 플러그인과 댓글 플러그인 2개의 화일을 본인의 PC(Lap Top)에 다운로드 받습니다. [fusion_fontawesome icon=”fa-chevron-right” circle=”yes” size=”13px” iconcolor=”” circlecolor=”” circlebordercolor=”” rotate=”” spin=”no” animation_type=”0″ animation_direction=”down” animation_speed=”0.1″ alignment=”left” class=”” id=””/]다운로드 받은 KBOARD 게시판을 설치하기 위해서 Plugins > Add New로 이동 한 후, Upload Plugin을 클릭 합니다. [fusion_fontawesome icon=”fa-chevron-right” circle=”yes” size=”13px” iconcolor=”” circlecolor=”” circlebordercolor=”” rotate=”” spin=”no” animation_type=”0″ animation_direction=”down” animation_speed=”0.1″ alignment=”left” class=”” id=””/]’Choose File’을 선택 후 아래 그림과 같이 kboard-wordpress-plugin-X.X.X 화일 (게시판 플러그인 메인 화일)을 선택 합니다. [fusion_fontawesome icon=”fa-chevron-right” circle=”yes” size=”13px” iconcolor=”” circlecolor=”” circlebordercolor=”” rotate=”” spin=”no” animation_type=”0″ animation_direction=”down” animation_speed=”0.1″ alignment=”left” class=”” id=””/]‘Install Now’를 클릭 합니다. [fusion_fontawesome icon=”fa-chevron-right” circle=”yes” size=”13px” iconcolor=”” circlecolor=”” circlebordercolor=”” rotate=”” spin=”no” animation_type=”0″ animation_direction=”down” animation_speed=”0.1″ alignment=”left” class=”” id=””/]‘Active Plugin’을 클릭 합니다. [fusion_fontawesome icon=”fa-chevron-right” circle=”yes” size=”13px” iconcolor=”” circlecolor=”” circlebordercolor=”” rotate=”” spin=”no” animation_type=”0″ animation_direction=”down” animation_speed=”0.1″ alignment=”left” class=”” id=””/]’댓글 플러그인 4.4 버젼을 설치 하기 위해서 Plugins > Add New로 이동해서 ‘Upload Plugin’을 클릭 합니다. [fusion_fontawesome icon=”fa-chevron-right” circle=”yes” size=”13px” iconcolor=”” circlecolor=”” circlebordercolor=”” rotate=”” spin=”no” animation_type=”0″ animation_direction=”down” animation_speed=”0.1″ alignment=”left” class=”” id=””/]Choose File을 클릭해서 댓글 플러그인인 ‘kboard-comments-wordpress-plugin-X.X’를 선택 합니다. 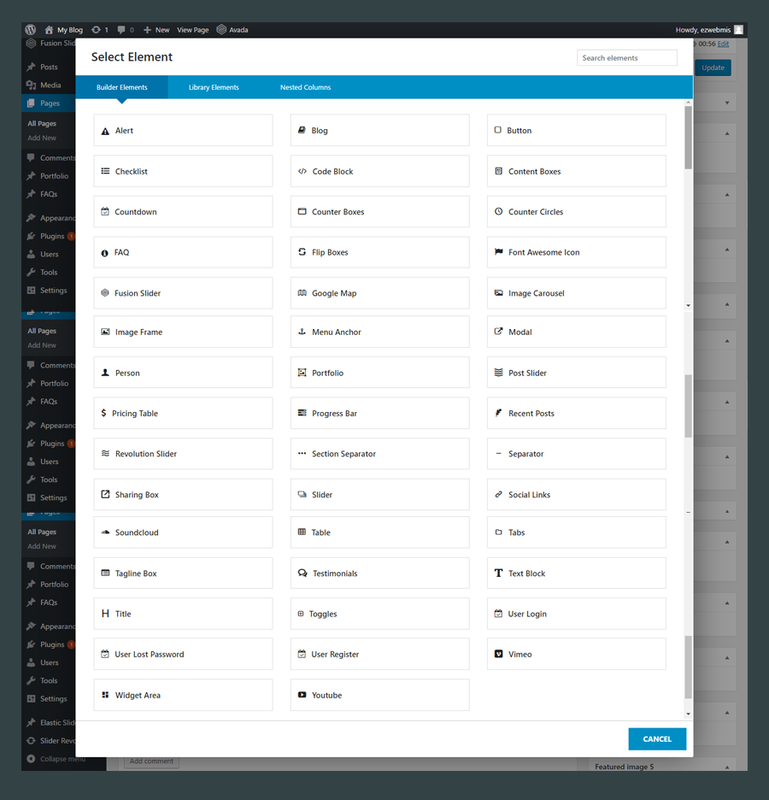 [fusion_fontawesome icon=”fa-chevron-right” circle=”yes” size=”13px” iconcolor=”” circlecolor=”” circlebordercolor=”” rotate=”” spin=”no” animation_type=”0″ animation_direction=”down” animation_speed=”0.1″ alignment=”left” class=”” id=””/]’Install Now’를 클릭합니다. [fusion_fontawesome icon=”fa-chevron-right” circle=”yes” size=”13px” iconcolor=”” circlecolor=”” circlebordercolor=”” rotate=”” spin=”no” animation_type=”0″ animation_direction=”down” animation_speed=”0.1″ alignment=”left” class=”” id=””/]’Activate Plugin’을 클릭합니다. 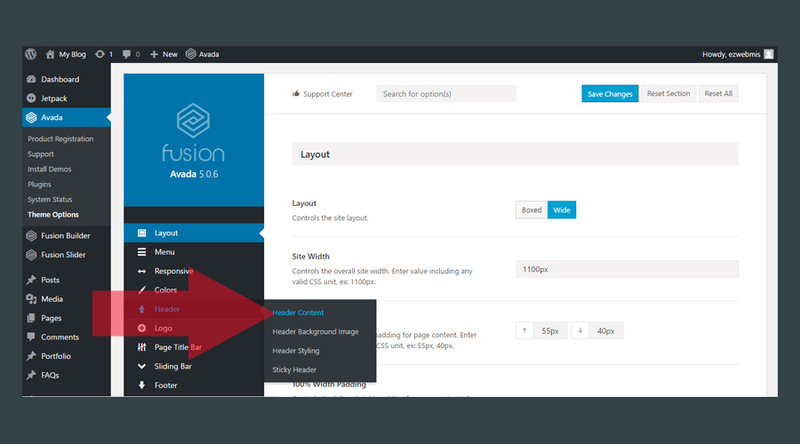 [fusion_fontawesome icon=”fa-chevron-right” circle=”yes” size=”13px” iconcolor=”” circlecolor=”” circlebordercolor=”” rotate=”” spin=”no” animation_type=”0″ animation_direction=”down” animation_speed=”0.1″ alignment=”left” class=”” id=””/]Kboard > New Forum’으로 이동 합니다. [fusion_fontawesome icon=”fa-chevron-right” circle=”yes” size=”13px” iconcolor=”” circlecolor=”” circlebordercolor=”” rotate=”” spin=”no” animation_type=”0″ animation_direction=”down” animation_speed=”0.1″ alignment=”left” class=”” id=””/]새 게시판 만들기 (일반설정). 아래그림을 참조하세요. 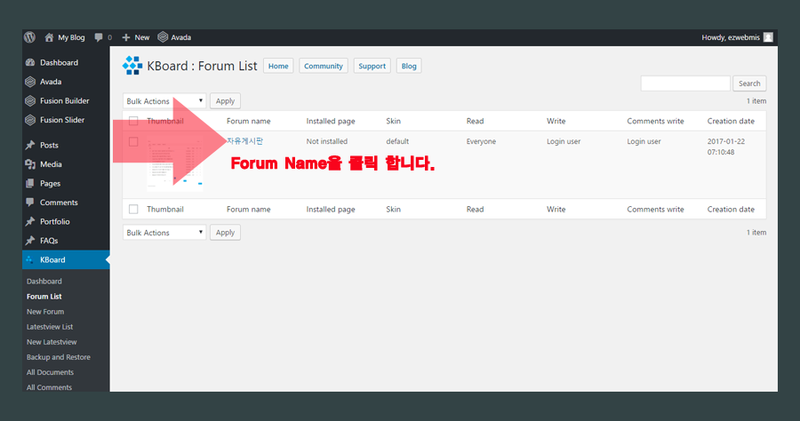 보다 자세한 설정 방법은 KBOARD 사용자 커뮤니티 를 참조하세요. [fusion_fontawesome icon=”fa-chevron-right” circle=”yes” size=”13px” iconcolor=”” circlecolor=”” circlebordercolor=”” rotate=”” spin=”no” animation_type=”0″ animation_direction=”down” animation_speed=”0.1″ alignment=”left” class=”” id=””/]새 게시판 만들기 (보안설정). 아래그림을 참조하세요. 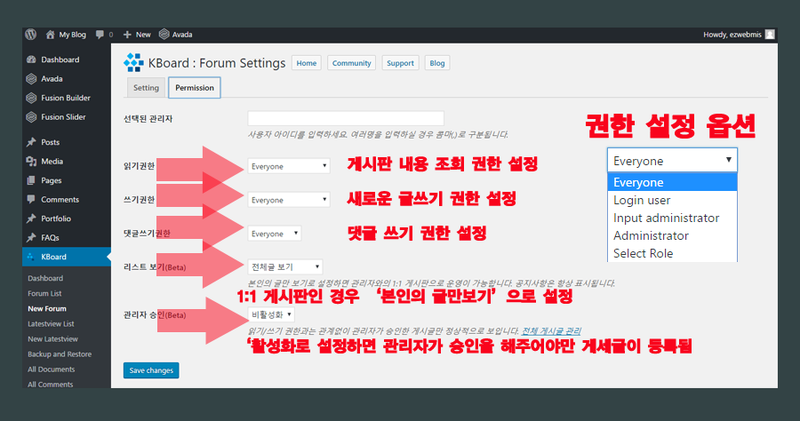 보다 자세한 설정 방법은 KBOARD 사용자 커뮤니티 를 참조하세요. [fusion_fontawesome icon=”fa-chevron-right” circle=”yes” size=”13px” iconcolor=”” circlecolor=”” circlebordercolor=”” rotate=”” spin=”no” animation_type=”0″ animation_direction=”down” animation_speed=”0.1″ alignment=”left” class=”” id=””/]Kboard > Forum List로 이동 한 후 게시판을 선택 합니다. [fusion_fontawesome icon=”fa-chevron-right” circle=”yes” size=”13px” iconcolor=”” circlecolor=”” circlebordercolor=”” rotate=”” spin=”no” animation_type=”0″ animation_direction=”down” animation_speed=”0.1″ alignment=”left” class=”” id=””/]페이지 메인 컨텐츠 부분에 Copy해 두었던 ‘게시판숏코드’를 븥여넣습니다. ‘Update’를 클릭 합니다. [fusion_fontawesome icon=”fa-chevron-right” circle=”yes” size=”13px” iconcolor=”” circlecolor=”” circlebordercolor=”” rotate=”” spin=”no” animation_type=”0″ animation_direction=”down” animation_speed=”0.1″ alignment=”left” class=”” id=””/]실제로 웹사이트에 접속해서 게시판이 정상적으로 만들어졌는지 확인합니다. 아래 그림과같이 ‘자유게시판’이라는 게시판이 정상적으로 만들어 졌음을 확인 할 수 있습니다. 웹사이트를 운영하면서 접속자에 대한 통계정보를 기록하는 것은 아주 중요합니다. 웹사이트를 접속한 사용자의 위치(국가), 어떤 검색엔진을 통해서 접속했는지, 어떤 키워드를 입력해서 접속을 했는지, 하루/일주일/한달간의 접속 통계는 어떻게 되는지…등의 통계 정보를 잘 모니터링 하면 웹사이트 컨텐츠를 어떻게 운영해야 하는지, 온라인 마케팅을 어떤 방향으로 해야 하는지 실마리(Clue)를 얻게 됩니다. 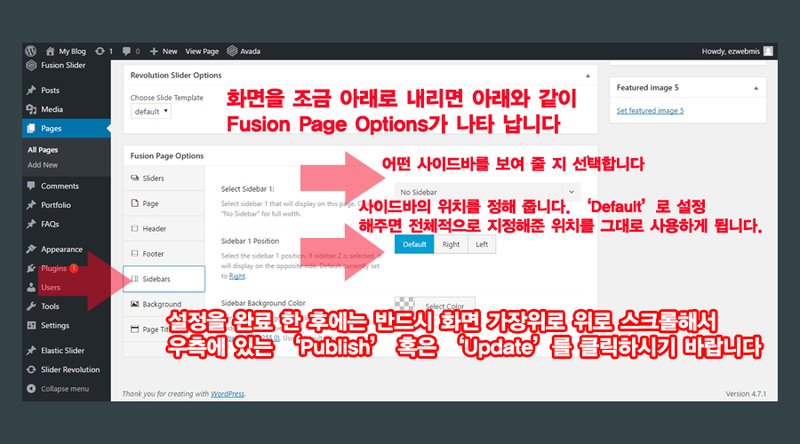 그래서 WP Statistics라는 유용한 웹사이트 접속 통계정보를 제공하는 플러그인을 소개 해드립니다..
[fusion_fontawesome icon=”fa-chevron-right” circle=”yes” size=”13px” iconcolor=”” circlecolor=”” circlebordercolor=”” rotate=”” spin=”no” animation_type=”0″ animation_direction=”down” animation_speed=”0.1″ alignment=”left” class=”” id=””/]Plugins > Add New 를 클릭 합니다. 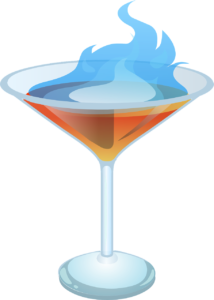 [fusion_fontawesome icon=”fa-chevron-right” circle=”yes” size=”13px” iconcolor=”” circlecolor=”” circlebordercolor=”” rotate=”” spin=”no” animation_type=”0″ animation_direction=”down” animation_speed=”0.1″ alignment=”left” class=”” id=””/]Keyword를 ‘wp statistics’라고 입력 합니다. 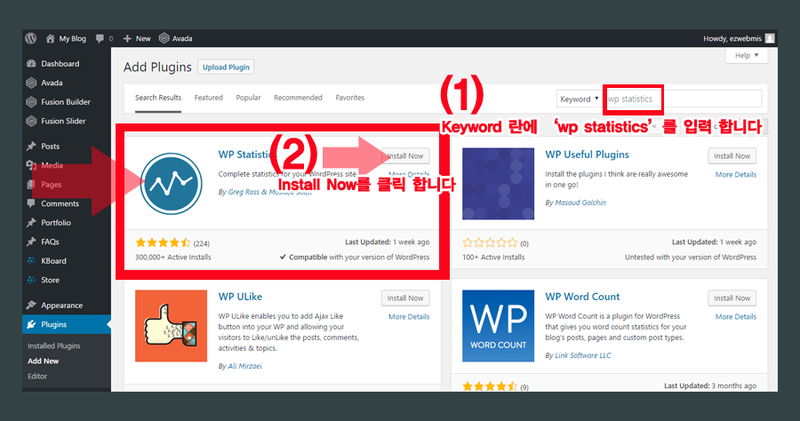 그런후 아래와 같이 리스트가 나오면 첫번째 플러그인인 WP Statistics의 ‘Install Now’를 클릭 합니다. [fusion_fontawesome icon=”fa-chevron-right” circle=”yes” size=”13px” iconcolor=”” circlecolor=”” circlebordercolor=”” rotate=”” spin=”no” animation_type=”0″ animation_direction=”down” animation_speed=”0.1″ alignment=”left” class=”” id=””/]’Activate’을 클릭합니다. [fusion_fontawesome icon=”fa-chevron-right” circle=”yes” size=”13px” iconcolor=”” circlecolor=”” circlebordercolor=”” rotate=”” spin=”no” animation_type=”0″ animation_direction=”down” animation_speed=”0.1″ alignment=”left” class=”” id=””/]WP Statistics가 정상적으로 설치 된후 아래와 같이 WP Statistics > Overview를 클릭 합니다. [fusion_fontawesome icon=”fa-chevron-right” circle=”yes” size=”13px” iconcolor=”” circlecolor=”” circlebordercolor=”” rotate=”” spin=”no” animation_type=”0″ animation_direction=”down” animation_speed=”0.1″ alignment=”left” class=”” id=””/]아래 그림과 같이 다양한 웹사이트 방문 통계 정보를 확인 하실 수 있습니다. 이글보고 따라하고 있는데요 사이트그라운드에서 워드프레스설치까지 끝났는데 내주소/wp-admin 으로 들어가도 연결이 안되는데 왜그런걸까요? 먼저 원래 도메인주소로 웹사이트가 뜨는지 확인 해 보셔야 할 것 같습니다. 만약 웹사이트가 계속 오픈이 않되면 도메인 설정을 확인해 보셔야 할 것 같습니다. 웹사이트가 정상적으로 오픈되면 관리자도 문제없이 오픈이 되야 정상 입니다. 제가 원하는 것은 저 주소의 글처럼 왼쪽에 글의 목차를 보여주고 클릭하면서 글을 읽게 하는 홈페이지를 만들고 싶거든요. 저런 것이 Avada 테마로 가능할까요? 안녕하세요. 글 잘 읽었습니다. 다름이 아니라, Avada 테마로 다음과 같은 형식의 사이트를 제작할 수 있을까요? 위 사이트는 튜토리얼을 가르쳐주는 방식으로 글을 작성하는데요. 왼쪽에 사이드바 부분에 글의 목차를 보여주고 오른쪽에 목차에 따른 내용을 출력합니다. Avada에서 페이지마다 사이드바를 설정하는것이 가능하다고 적혀 있는데 저 형식은 글마다 사이드바 내용이 바뀌는 것이라 가능할지 싶어서요. 문의 하신 내용은 여러방식으로 구현이 가능할 것 같습니다. 첫번째 방식은 Avada 페이지 빌더에서 기본적으로 제공하는 Tab기능을 써서 구현이 가능할 것 같습니다. Tab title을 위가 아닌 왼쩍 옆에 보이게 설정이 가능합니다. 물론, Sample 로 주신 사이트와 같이 보이게 하려면 약간의 Tweak(디자인 적인..)이 필요할 것 입니다. 두번째는 적당한 플러그인을 찾아서 적용 가능 할 것 같습니다. 강좌같은 좋은 컨텐츠 잘 보았습니다. 궁금한점이 있는데, 워드프래스를 이용하여 커뮤니티 사이트를 제작하려고 합니다. Google Blog나 Imgur 같은 곳에서 끌어와도 문제가 없는지 궁금합니다. 문의하신 내용에 답변을 드리면, 회원가입/로그인/로그아웃 등의 기능은 기본적으로 충분히 제공 됩니다. 한국웹사이트에서 회원가입을 하는것과 다르게 간단한 정보 (이름, 이메일, 사옹자아이디, 비밀번호)등 만을 입력하면 쉽게 회원으로 등록 가능 합니다. 일단 회원가입을 한 후 에는 사용자마다 프로파일 페이지(회원 개인정보 홈)가 만들어집니다. 다양한 플러그인을 이용해서 프로파일에 항목을 추가하거나, 회원의 레벨을 설정하거나, 화원 가입비를 설정하는등 다양한 방식으로 구현이 가능 합니다. 디자인테마 자체를 커뮤니티 사이트에 최적화된 것으로 선택 하시는것도 좋은 방법 입니다. 저희가 추천해드리는 웹호스팅 회사들은 대부분 무제한 데이터 전송량이 무제한 입니다. 호스팅 회사를 잘 선택하시면 트래픽 문제는 해결이 될 것으로 보입니다. 외부 이미지 링크를끌어와도 문제는 없습니다.